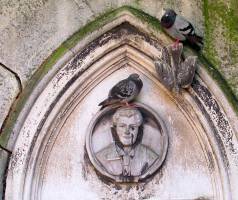 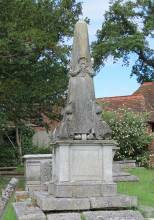 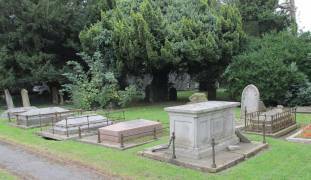 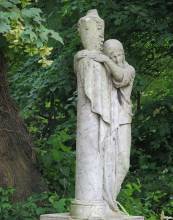 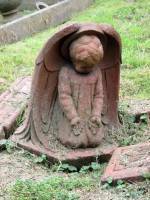 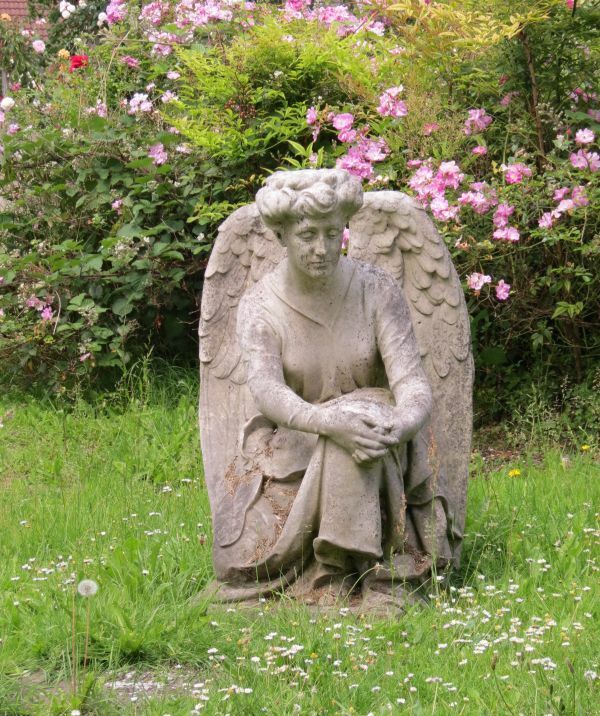 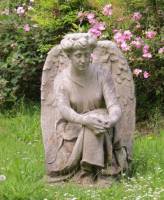 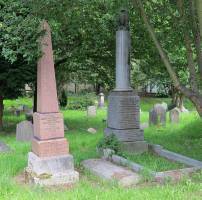 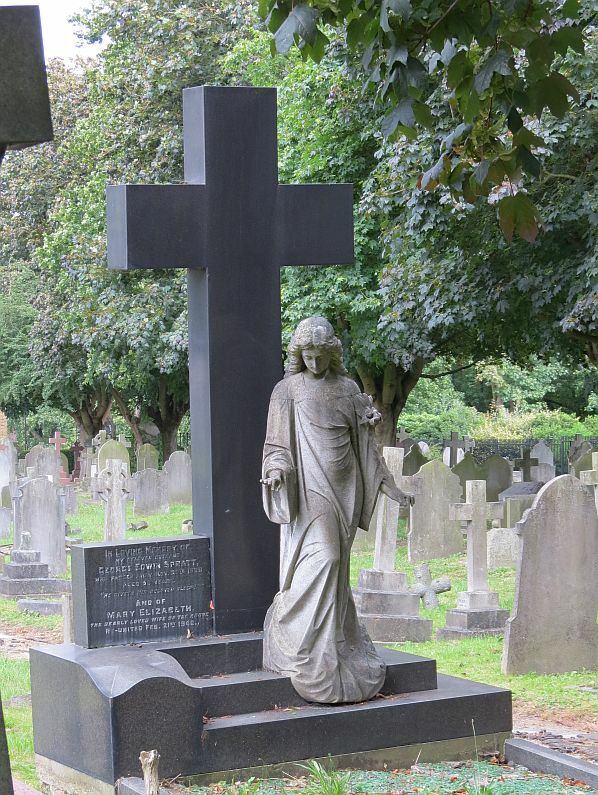 Anyone interested in sculpture will eventually be attracted by the churchyard and the cemetery. 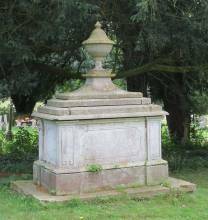 There are many types of monuments, and this page takes a descriptive look at them – sort of a hierarchy of funereal monuments outside. 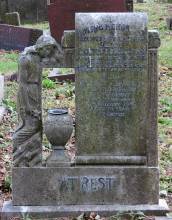 We start with the simple upright tombstone or headstone. 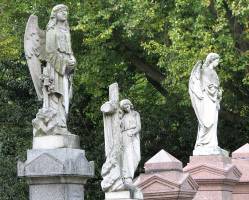 The types are the plain rectangle, the Classical and the Gothic. Gothic is probably most familiar, but actually this is characteristic mostly of mid-Victorian times and later, and the Classical is the more frequent type before then, and in any case for the more substantial, decorated examples, though both varieties are found in profusion. 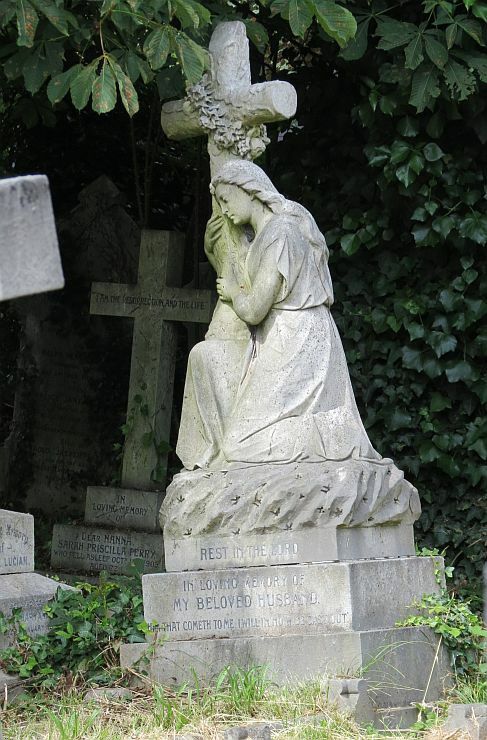 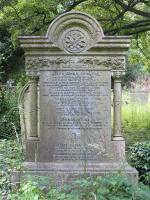 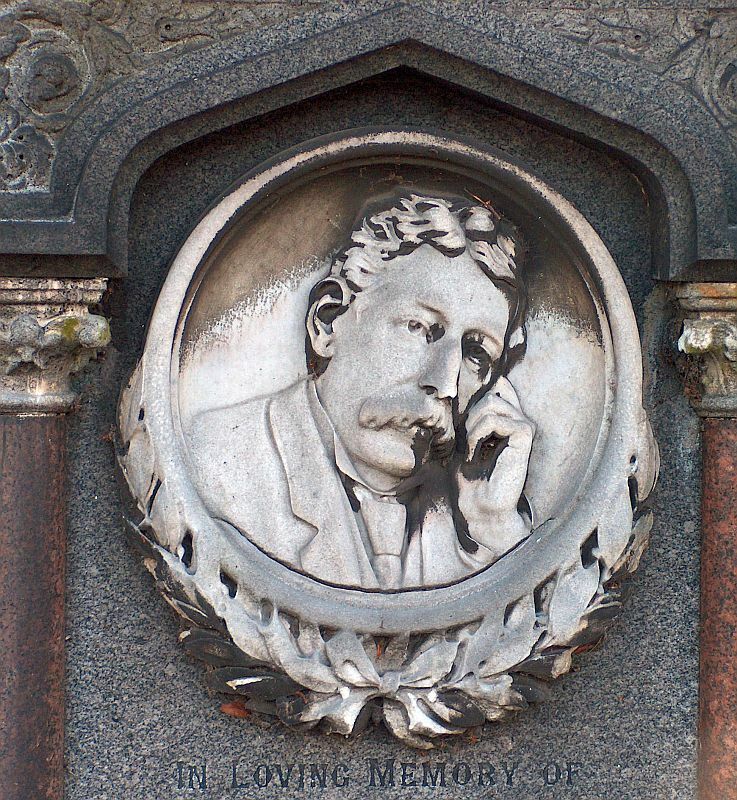 There are plenty of opportunities for artistic decoration as relief sculpture, as inscribed line ornament, and in small additions onto the edges and tops of headstones. 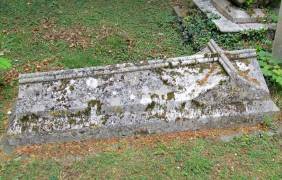 We see both low and high relief, though the former is unlikely to survive too long. Common examples of are flowers, unsurprisingly, and these may be very finely and naturalistically rendered. 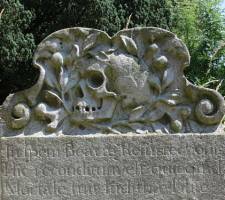 Other plants too, especially carvings in relief of corn or wheat, representing rebirth and fruitfulness, and dying trees, again in relief, a close equivalent of similar motifs inside the churches from 60 or 80 years previously, though far less common. 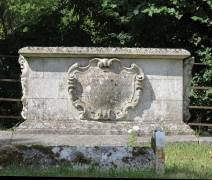 As well as reliefs, we may find carved wreaths and festoons and garlands of flowers. 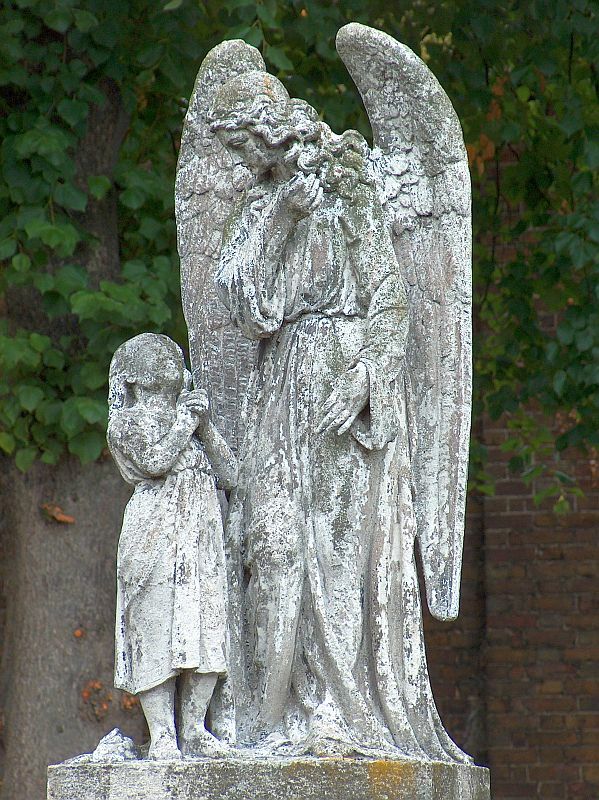 Angels in low relief are fairly common, sometimes in pairs on either side of an inscribed panel, or a single kneeling or standing figure, particularly in the early 20th Century. 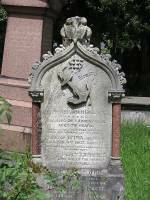 Decorative scrolling and simple motifs such as sunbursts are common. 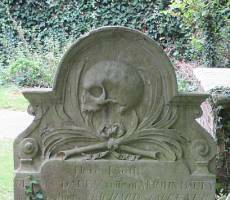 Skull and crossbone monuments . 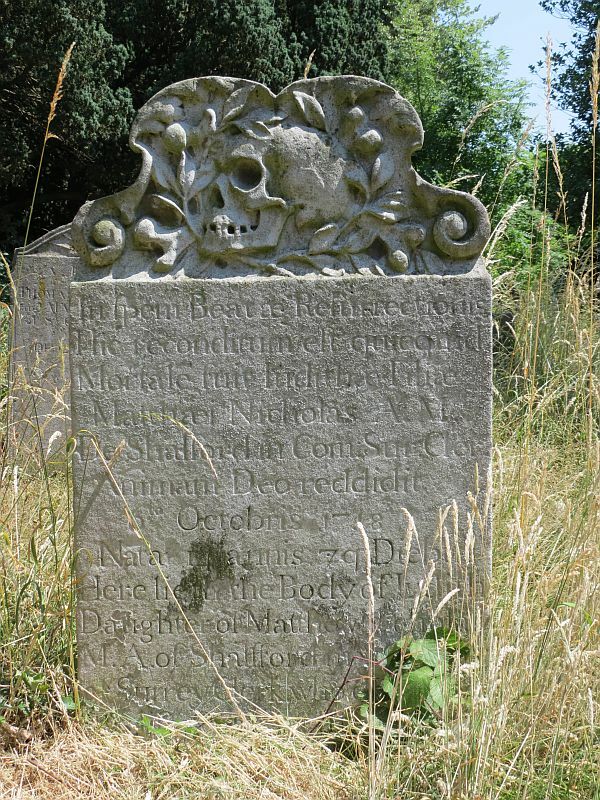 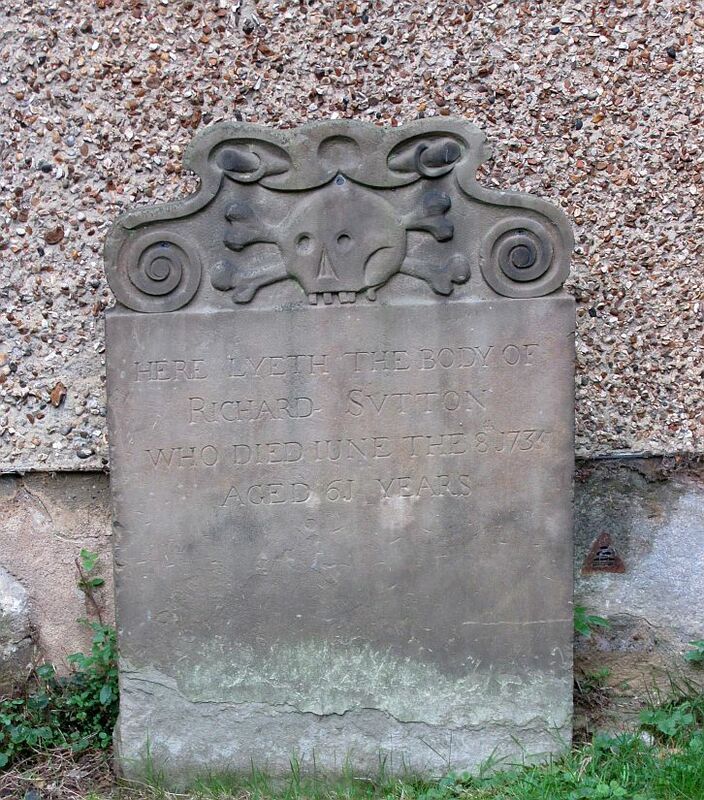 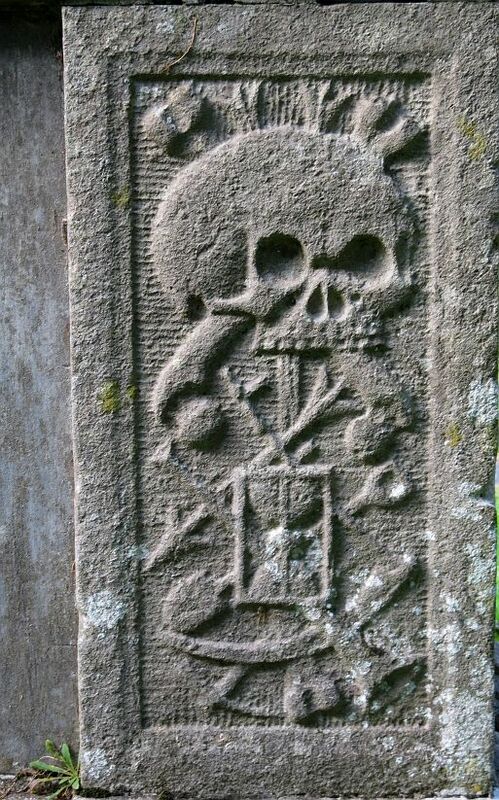 At the more macabre end of the scale, the 18th Century tablet or gravestone sees more or less the end of the skull and crossbones era, this being a popular memento mori to remind the viewer that death will be theirs too. 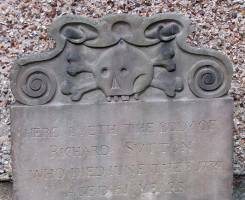 A variety of low relief skull designs may be found, with or without jawbones, and occasionally with wreath crowns – very much in the churchyards rather than the cemeteries, which are generally of too late a date for such things to be appreciated. 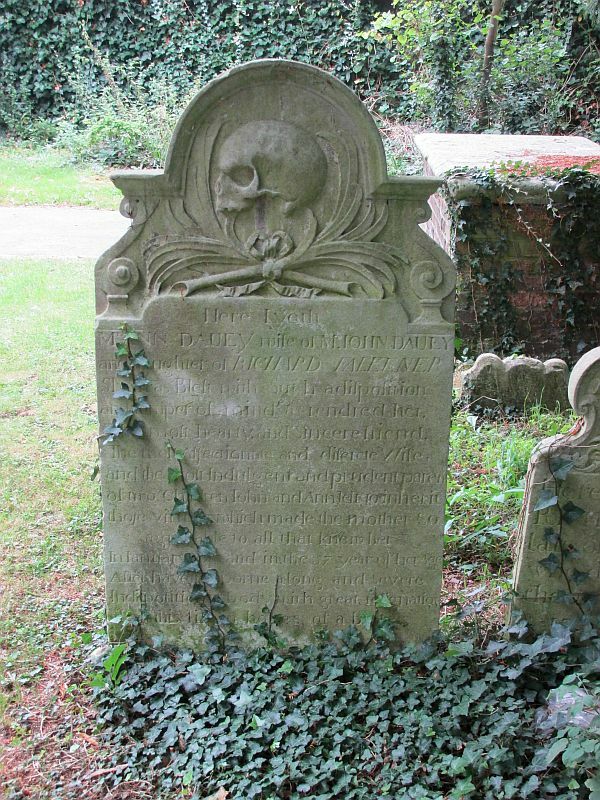 For some reason, such skulls generally face to the left rather than the right - not always, but most usually; a counter-example facing to the right is shown at the top of the page. 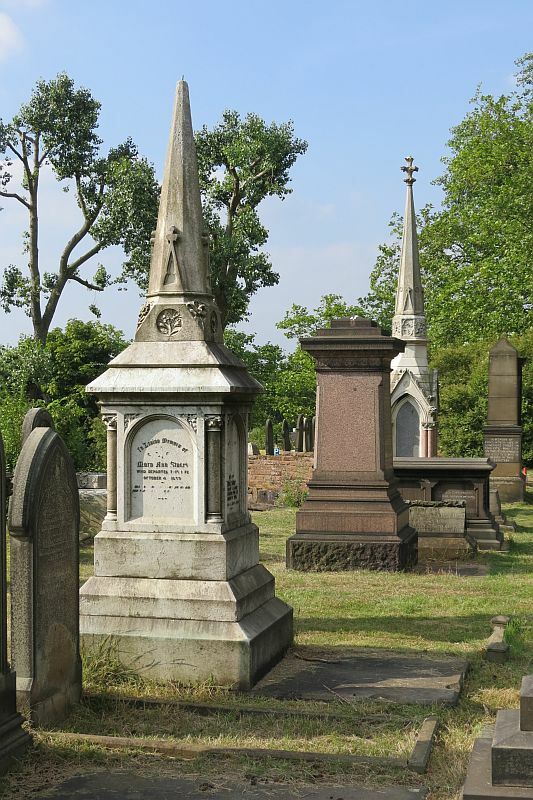 Next stage up, more ambitious, we have the monuments with more complex outlines, above all double-headstones, and those with more wiggly outlines - see picture above, far right. 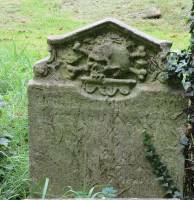 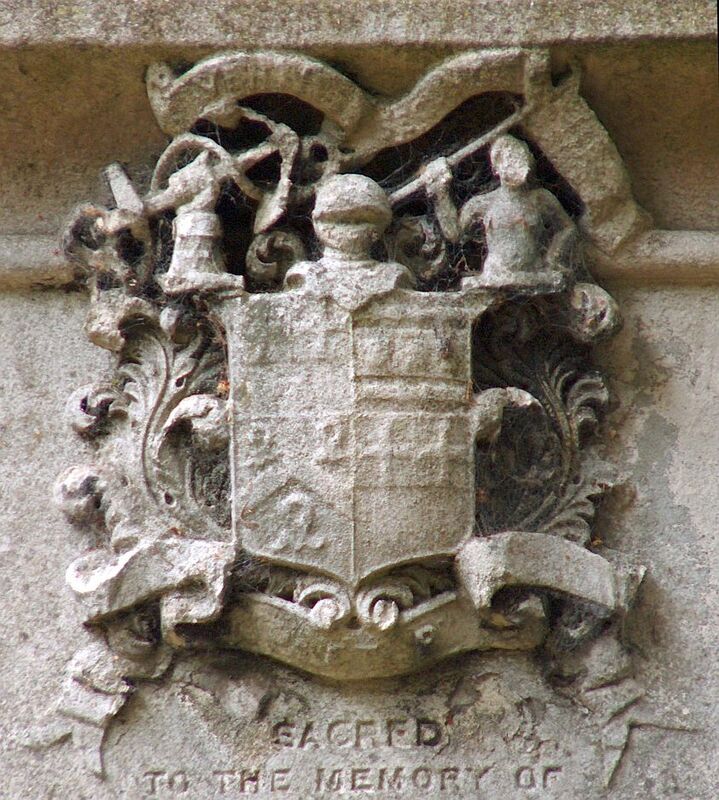 Lots of scope for minor sculptural adornments on the odd shaped tops to such stones. 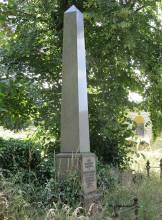 The top may bear a cross – more on these further down, and there is whole page on decorated crosses or crucifixes on this site. 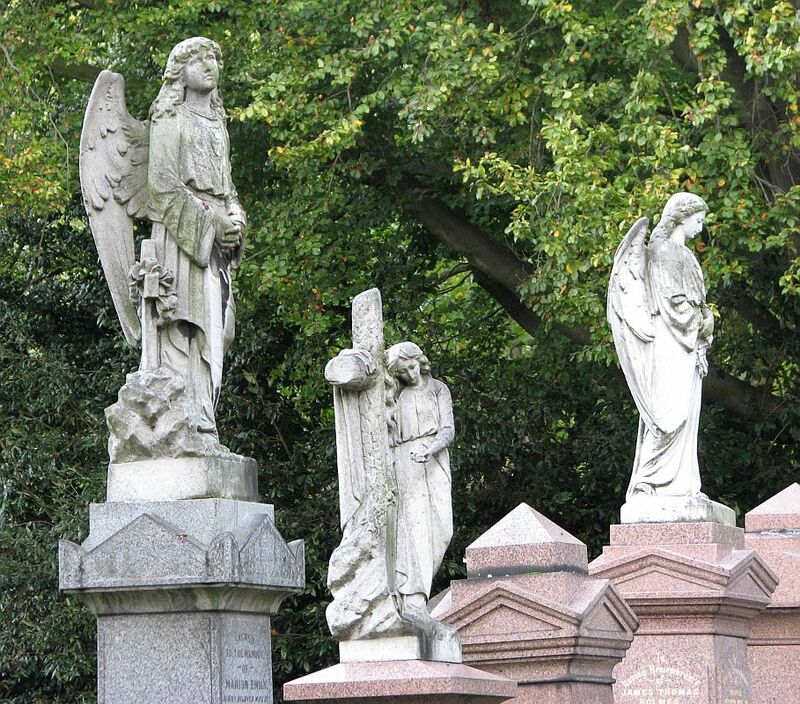 Classical panels, more ambitious . 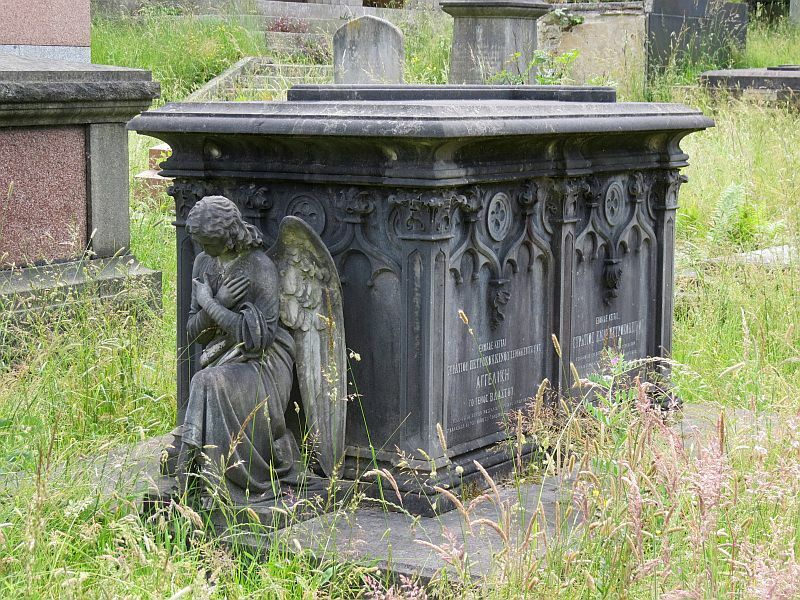 As already mentioned, the Classical is particularly well suited to more substantial headstones, with side pillars or pilasters (flat outlines of pillars), with pediments above. 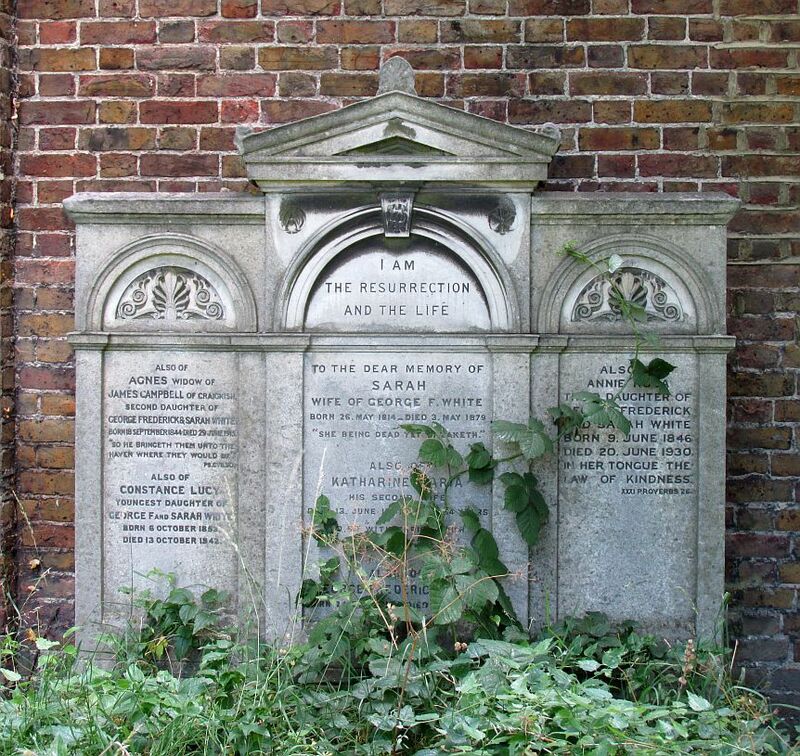 These are the equivalents of the Classical plaques inside the churches so beloved of the 18th Century, and, in more modest form, the early 19th Century. Such monuments are more architectural than sculptural, but there is space for minor ornament, in the pillar capitals, less frequently in the pediments, and in the central field above the inscription. Raised ledger monuments, including with crosses . 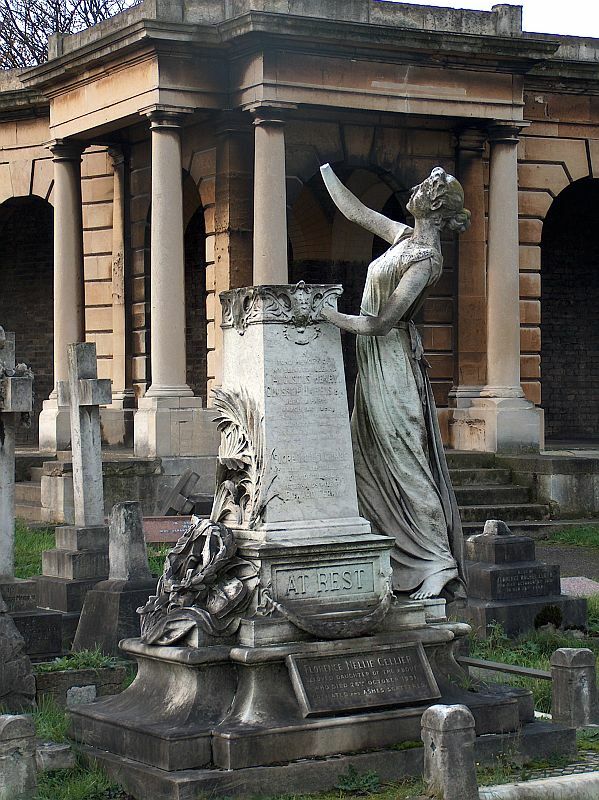 And to larger monuments. 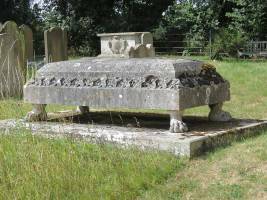 The most ancient of monuments inside the churches are the ledger stones, the great flat coffin-covering slabs, with an inscription and, sometimes a coat of arms. 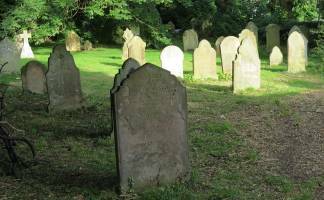 They are widespread in churchyards as ‘raised ledgers’, similar flat slabs generally raised somewhat above the surrounding turf. 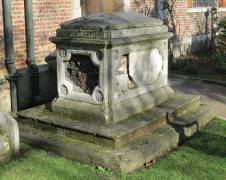 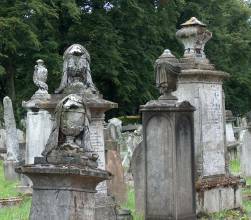 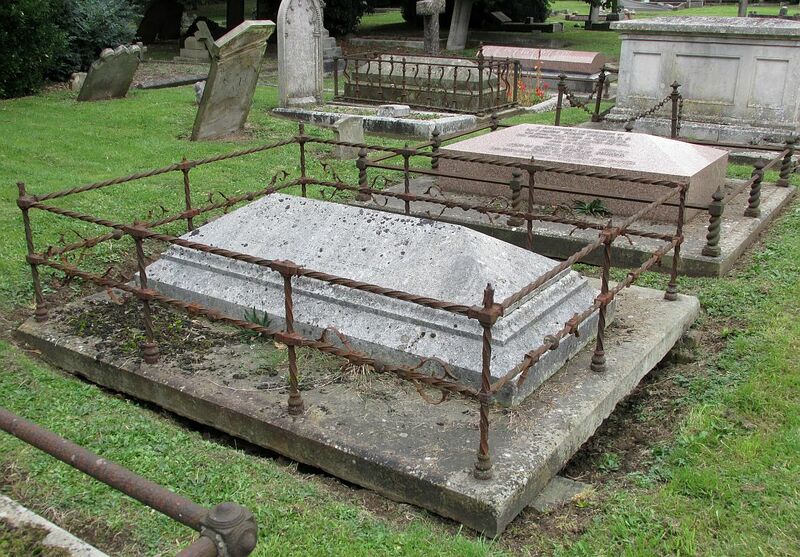 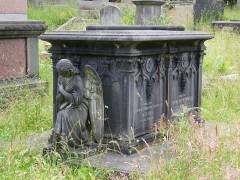 There are many from the 18th Century, and a revival took place in the 19th Century, often in granite rather than stone, and surrounded by railings or chains, though by the time of the newer cemeteries towards the end of the Victorian era, they were much less popular. 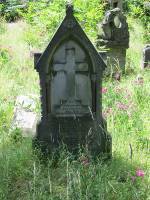 There might be a crucifix on such a stone, but sculptural decoration is not widespread. 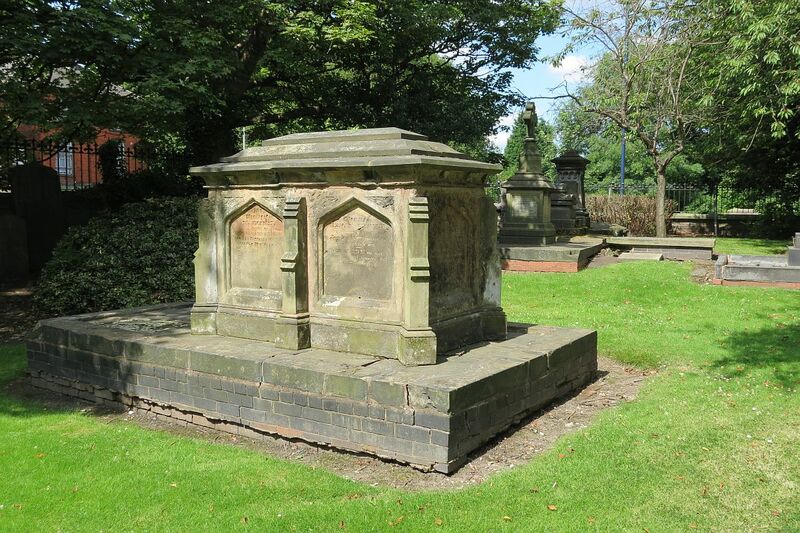 Chest tombs: 18th and 19th Century examples . 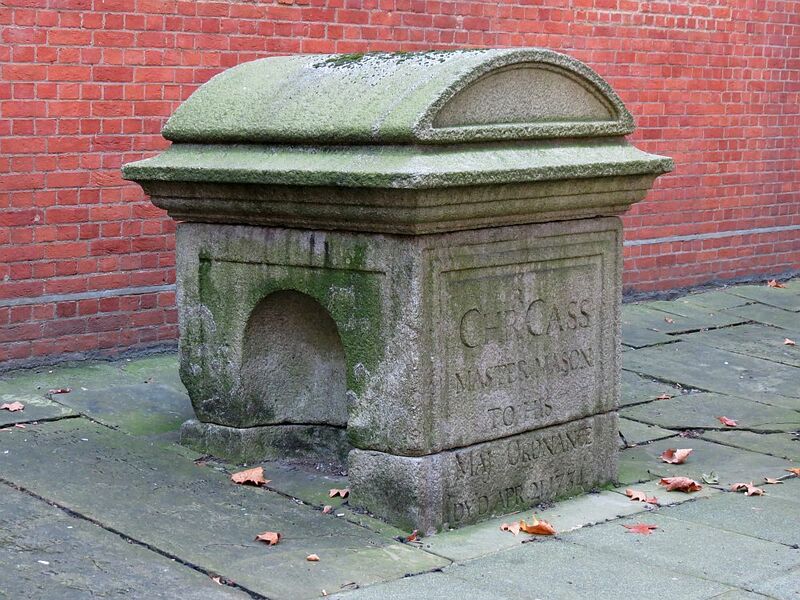 The three dimensional version of the ledger stone is the chest tomb, often called a tomb chest – the equivalent of the altar tomb inside the church. 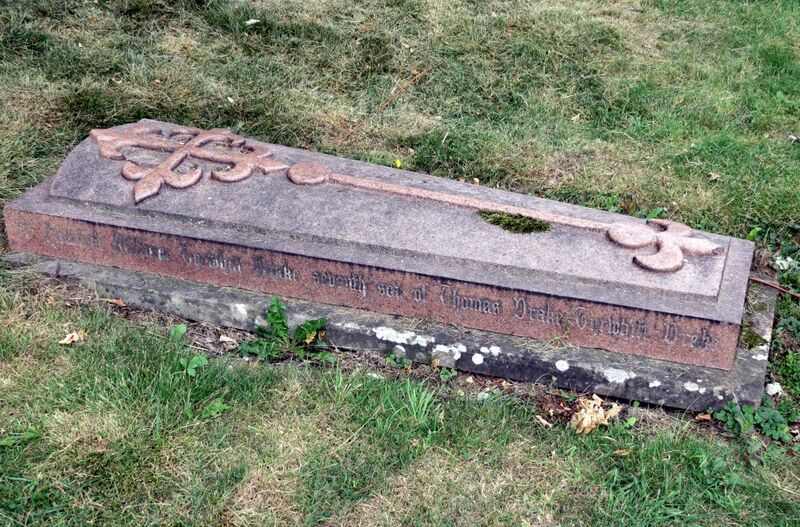 As the name suggests, it is a typically rectangular box shape, typically of white limestone, with a slab which may be in a harder, darker stone on top. 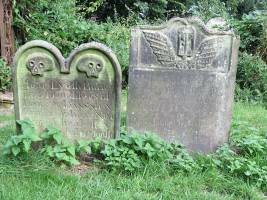 Although the surfaces get worn, their size and weight makes these among the longest-lasting churchyard monuments, and it is not uncommon to find them from the late 17th Century, and large numbers date from the 18th Century. 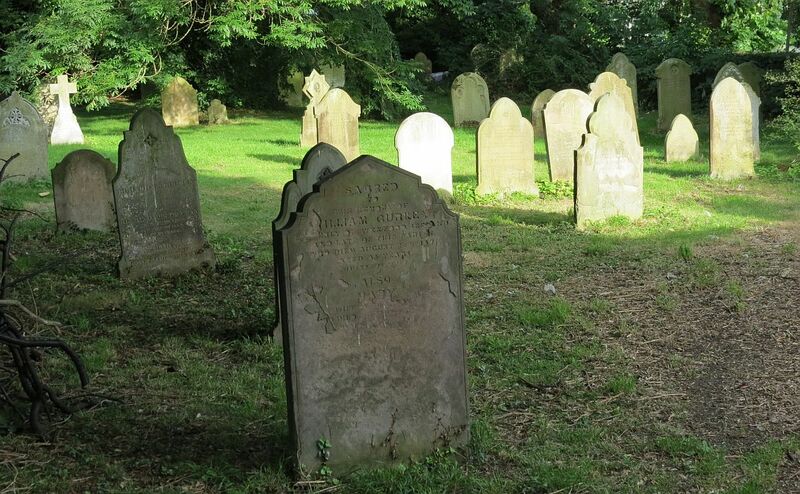 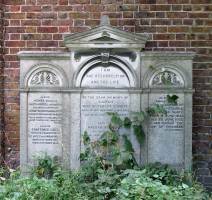 Often when an old churchyard is cleared to make way for a public park, the headstones are piled along the outer wall or removed entirely, while the altar tombs are left dotted around the open space. 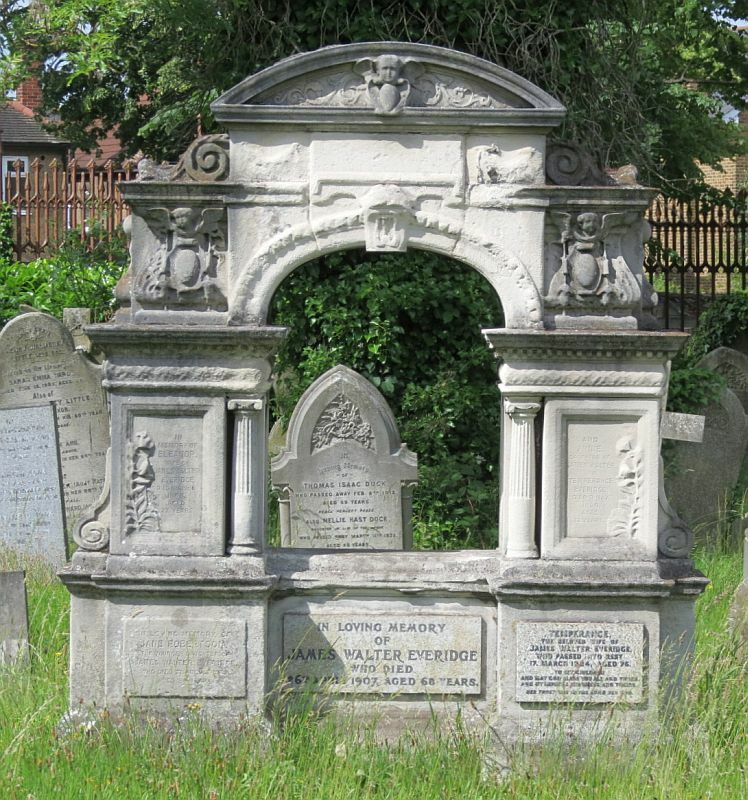 These are primarily architectural rather than sculptural monuments, with the variety tending to be in the dimensions and shapes, including plainer varieties and a popular type with S-shaped pillars or pilasters at the corners. 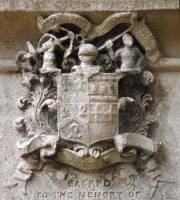 The main opportunities for carved work are at these corners, and above all in the older tomb chests, on the ends, where heraldic arms may be found, heavily carved and undercut so they will last out the generations. 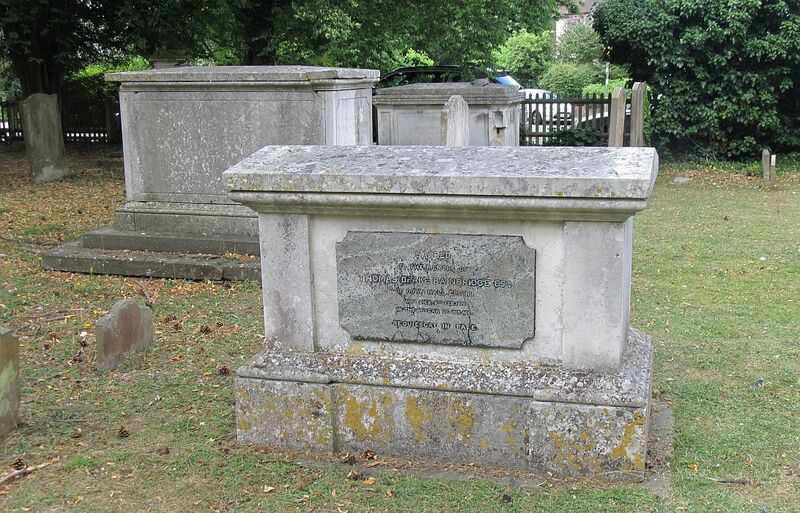 The inscriptions, particularly in the older examples, are typically on the top slabs, with later relatives often added on the long sides, or indeed all the way round. 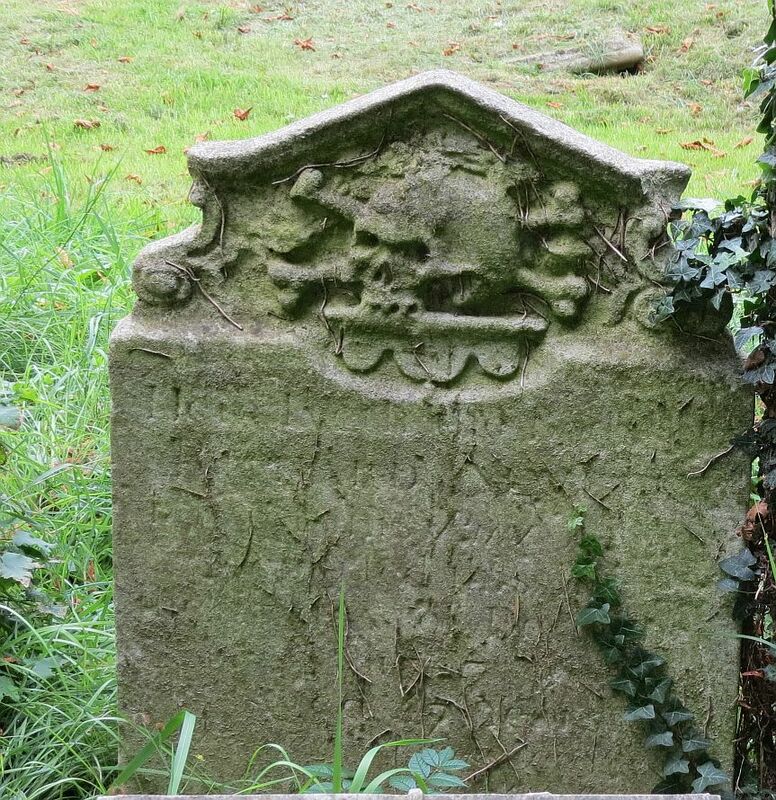 Carved side panels are occasionally found but are not usual. 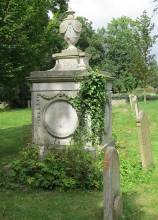 Many church monuments, particularly from the late 18th and early 19th Centuries when so many more modest panels were produced, are styled as ‘tomb chest ends’, thus looking like the view from one end of a tomb chest – rectangular panel, some lid rather like a pediment on top, side pilasters often no more than side-frames without capital or base, and underneath, little feet, often simply cut from the black backing panel which most such tablets have. 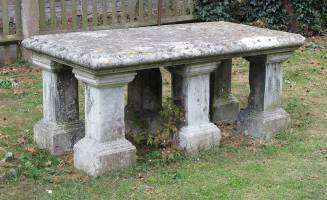 A variation of the chest tomb, rather uncommon and prone to collapse, is the table tomb. 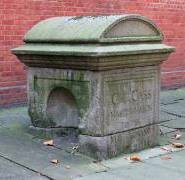 Sometimes used to describe the normal chest tomb, we usually use the term to distinguish those monuments where a flat slab or more solid block is raised entirely clear of the base on pillars, legs or other supports. 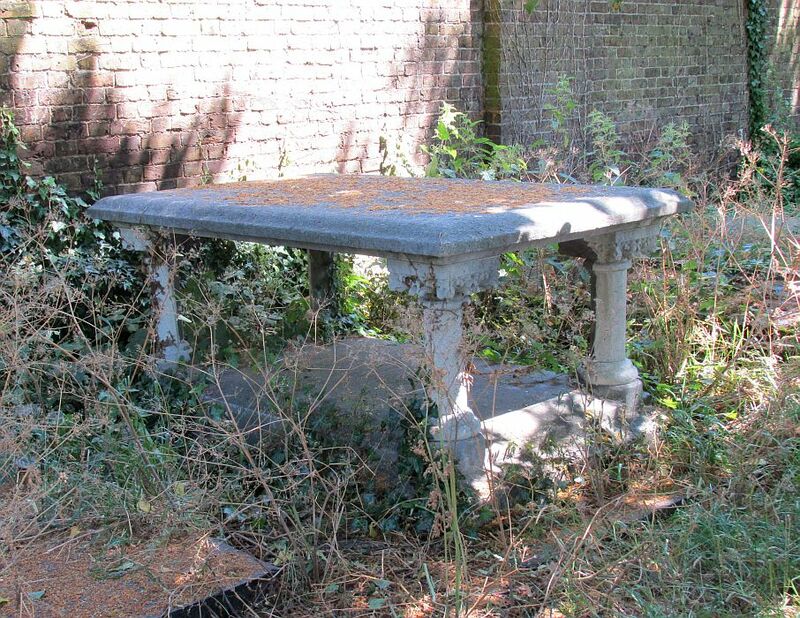 Not common at all, and when found, typically without sculptural ornamentation, with the exception of plant forms on the occasional Gothic table tomb. 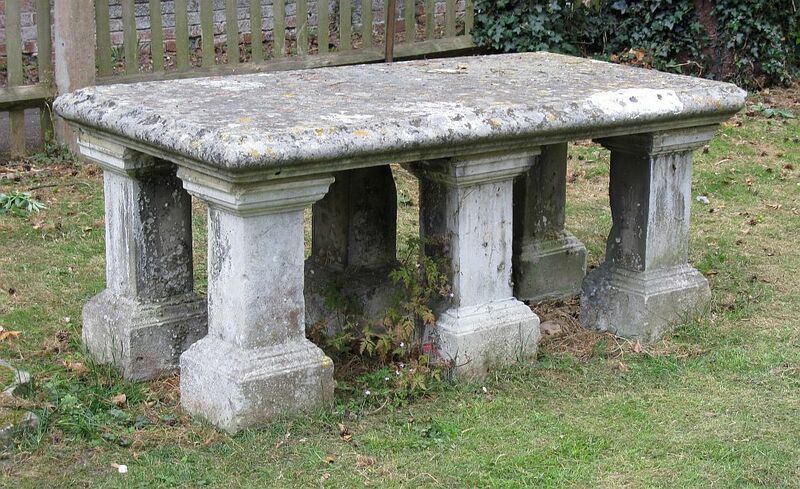 The examples above left and centre show thicker and thinner pillar legs, with the latter having carved capitals. 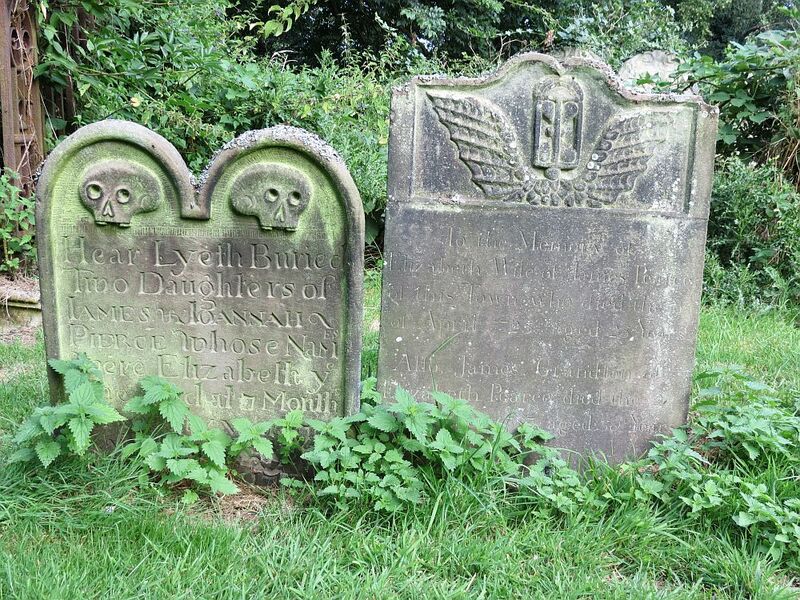 The squat example above right has lion feet, and repeating leaf carvings all the way round. 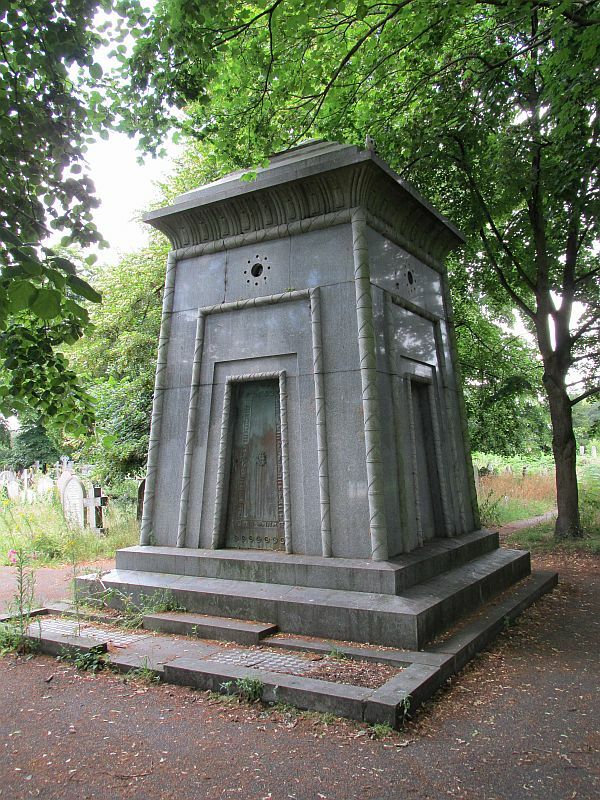 Another variation of the chest tomb is the casket tomb, where the side panels slope upwards and outwards, and here the top slab is more usually replaced by an angled ‘roof’ or lid. 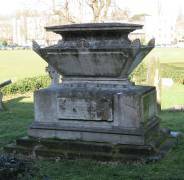 If the lid is fairly angled, pediment shapes may be put on the long or short sides, and acroteria (‘ears’) at the corners. 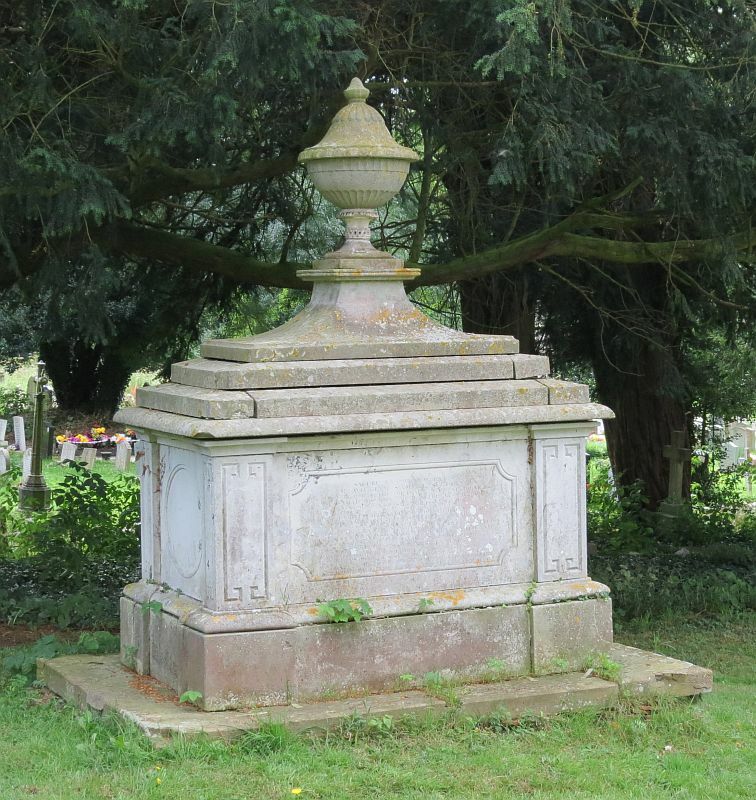 And given that the angle on top makes it less likely to put an inscription there, carved pots are more usual on casket tombs than on the boxy tomb chests. 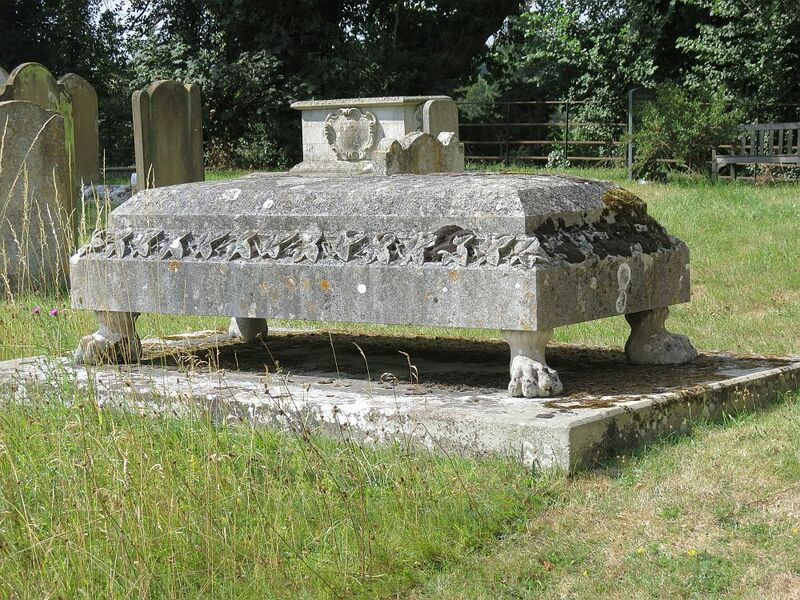 There are usually feet to these casket tombs, and they often take the form of carved lion feet, with pads and claws - the pictures above to the far left and far right have such carved lion feet. 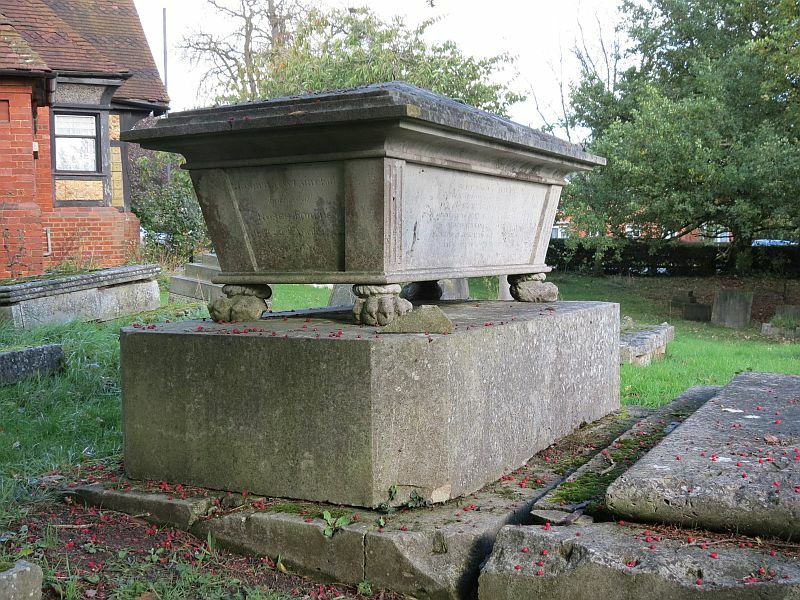 This use of feet means that casket tombs need to stand on some other stone, or they would simply sink into the ground, and flat panels, steps and raised plinths are common. Sometimes the casket stands on a full sized tomb chest underneath to give a more imposing monument, as in the picture above fourth along. 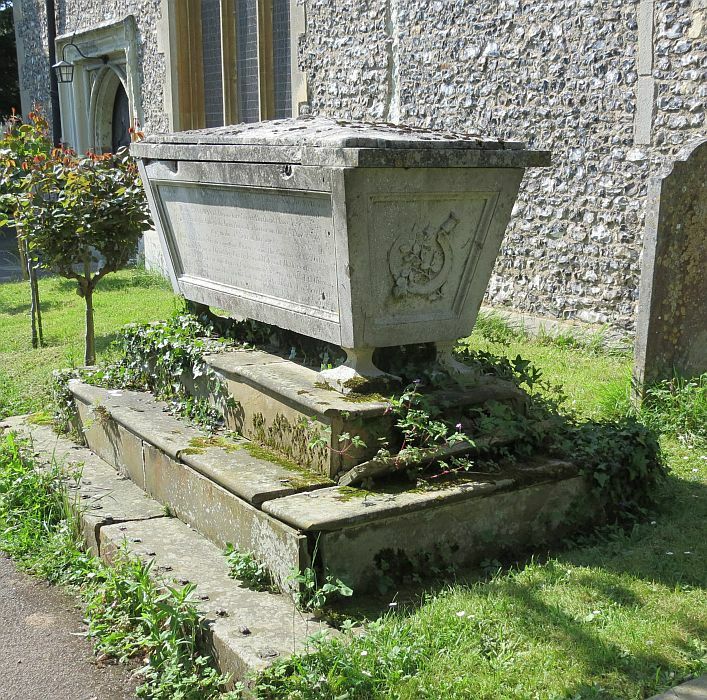 Because the lid of a casket tomb can overhang the sides, and the sides descend inwards, they are somewhat protected from the weather, so there is both good opportunity for sculptural decoration and it is more likely to last in less weathered form - if you click to enlarge the third example along, you can see a nice allegorical low relief of a sickle cutting a flower, indicating a young person cut down in the full bloom of their youth and beauty. 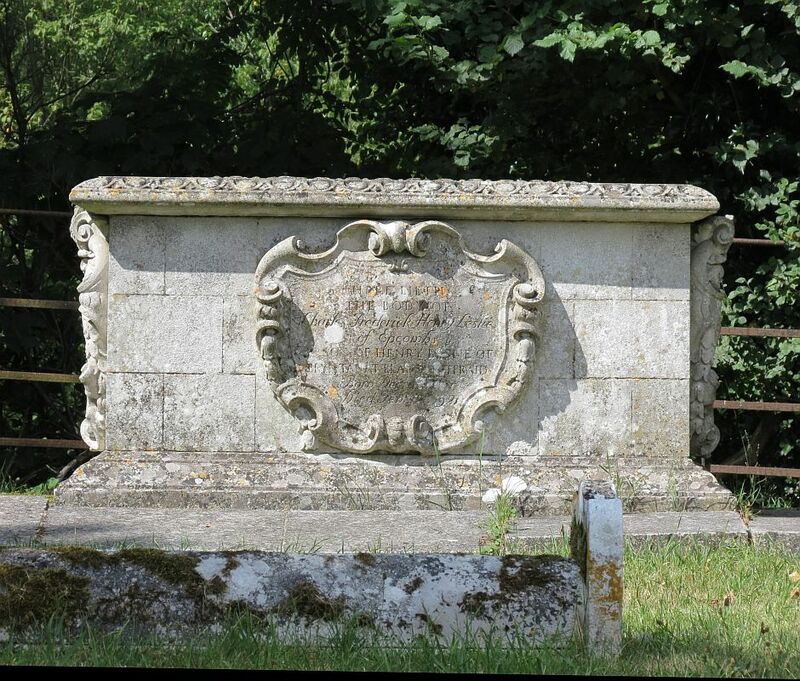 The really grand casket tombs then, can consist of a full casket sitting above a chest tomb, with carved lion feet, deep-cut scrolling on the sides and shields or emblems at the short ends, a pot on top with its own plinth, and with the inscription on the lower chest tomb, which itself may have corner pillars and carved coats of arms. 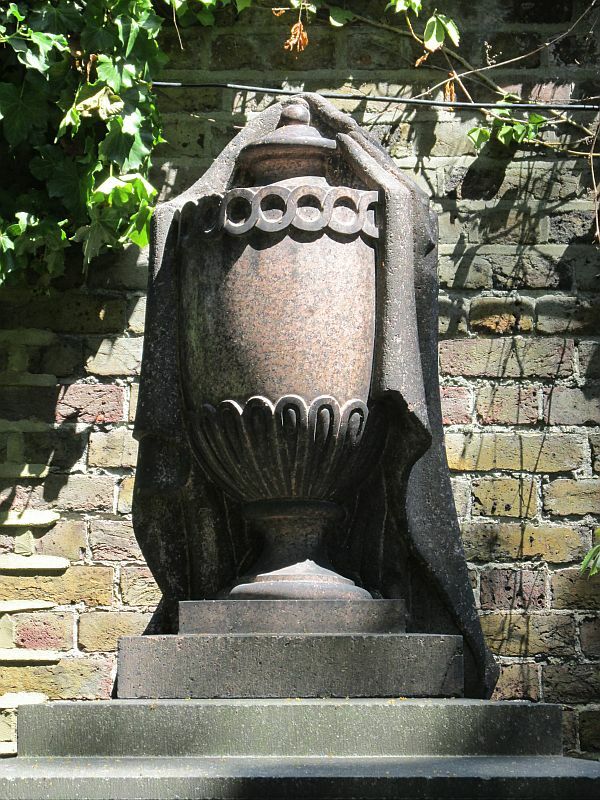 Monuments featuring pots or urns . 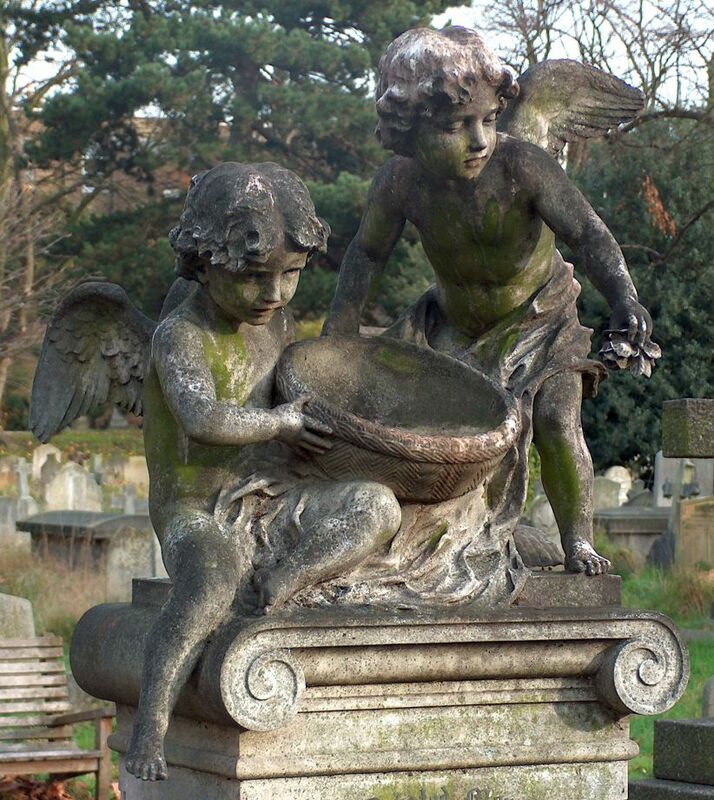 Pots then – a very popular addition particularly to the cemetery monument, though also found in church graveyards. 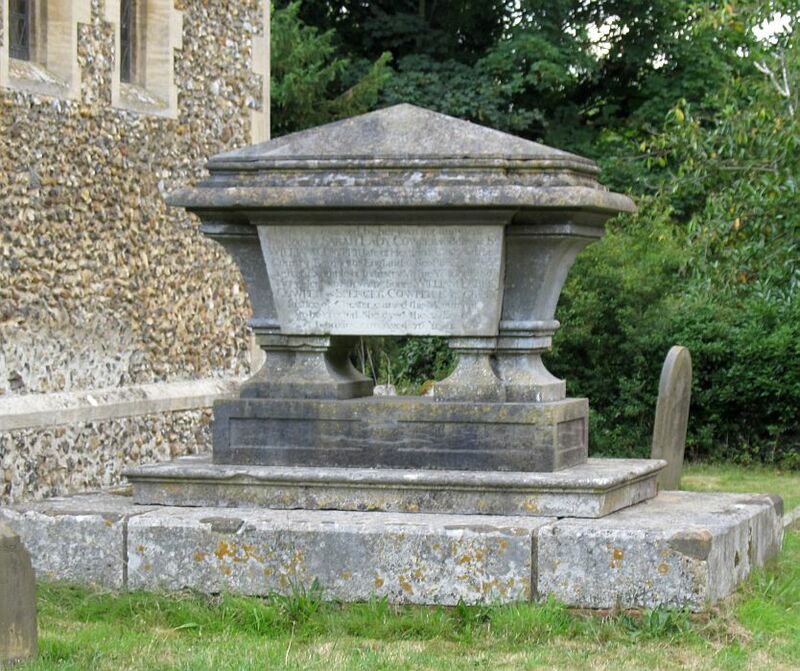 They are found not just on chest and casket tombs or in miniature to the sides of larger headstones, but often the whole monument consists of a tall plinth with a pot on top. The pots represent funereal urns, and are typically carved in Classical Greek or Roman shapes. 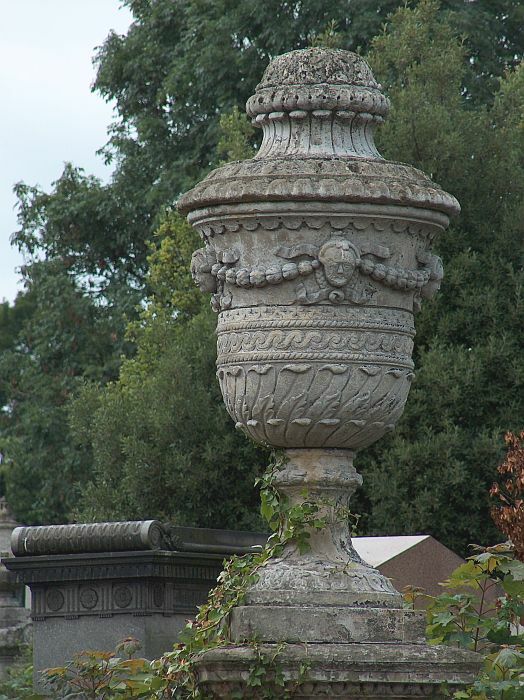 There is often a piece of drapery carved on the pot, which in the richer examples gives free rein to the monumental mason or sculptor to carve elaborate hanging folds, which may cover the base and pile up in interesting shapes on the top o f the plinth below, or even hang down its sides. 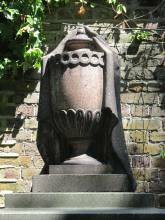 Similar usage of pots, generally in two dimensions rather than three, abound inside the churches. 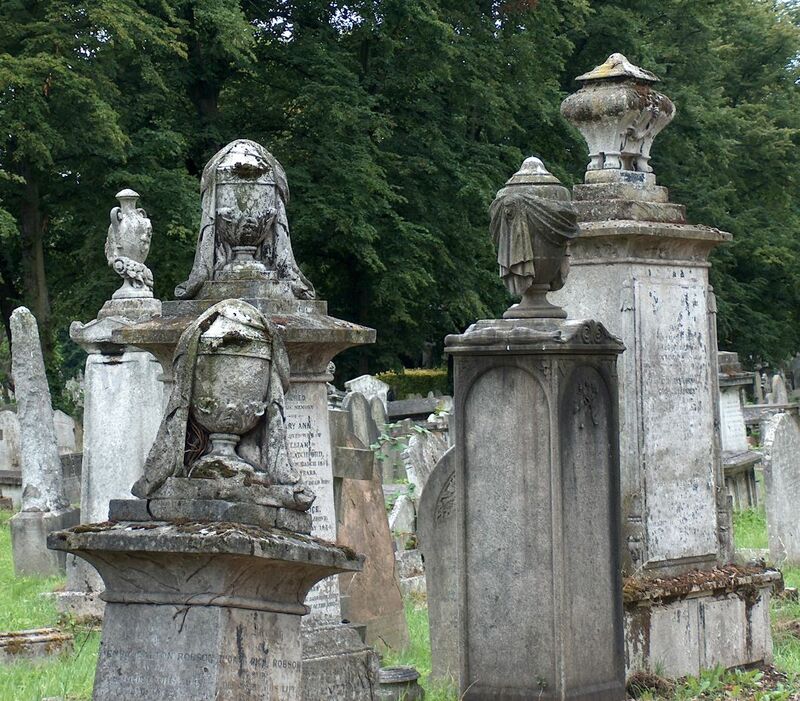 In Victorian times, such pots could be carved in hard granite as well as softer stone, and we can expect these pots to outlast everything else in the cemetery. 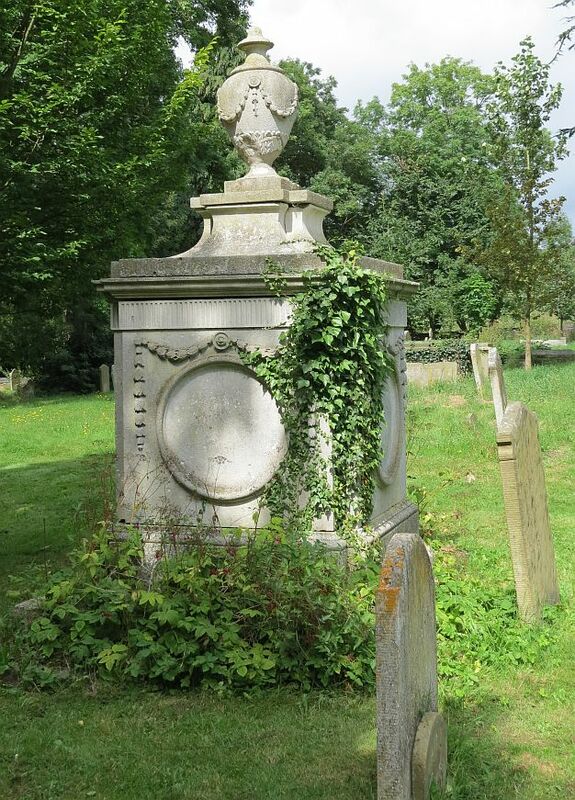 The pots themselves give plenty of scope for decoration on their bodies, lids and around the bases, with low relief carvings of leaves and other repeating designs, wreaths of flowers, and raised handles with rings being popular designs, though not so ornate as those in the churches, for reasons of structural integrity and longevity. The bases too can be carved, with upper portion of the plinth treated separately from the pot base in the more elaborate examples, and plenty of opportunity for geometrical designs on the sides of the plinth. 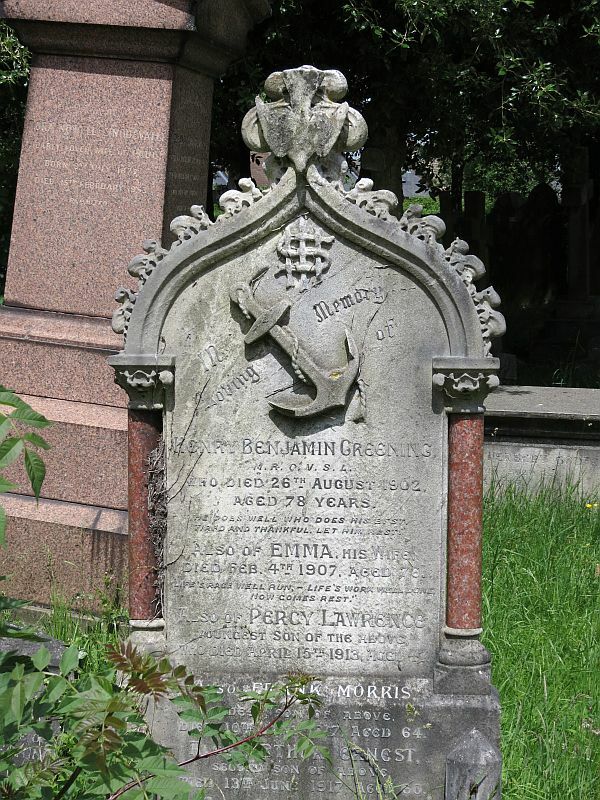 The pot, we recall, is generally a funereal urn, but we can have flaming pots too, and more sculptural examples can include, for example, entwined snakes around the body. 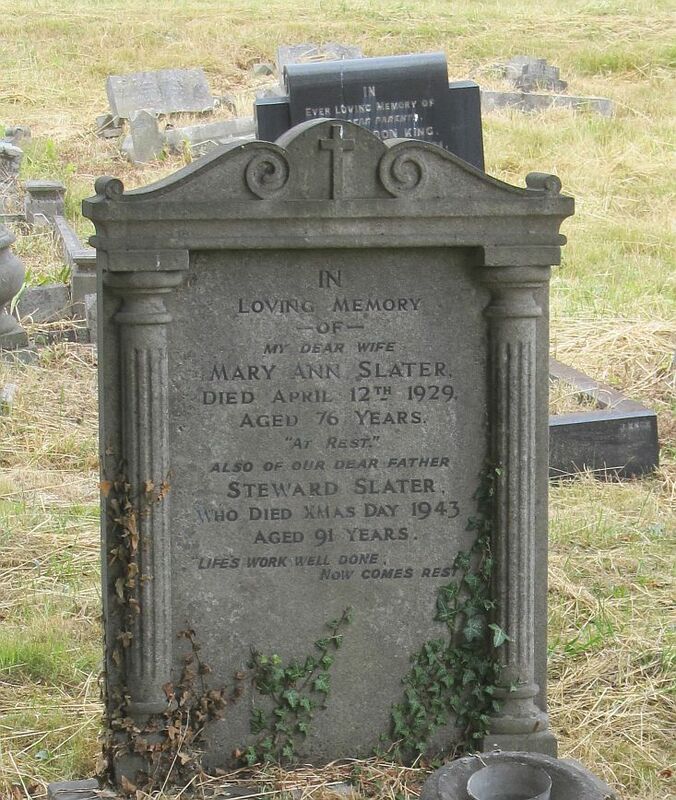 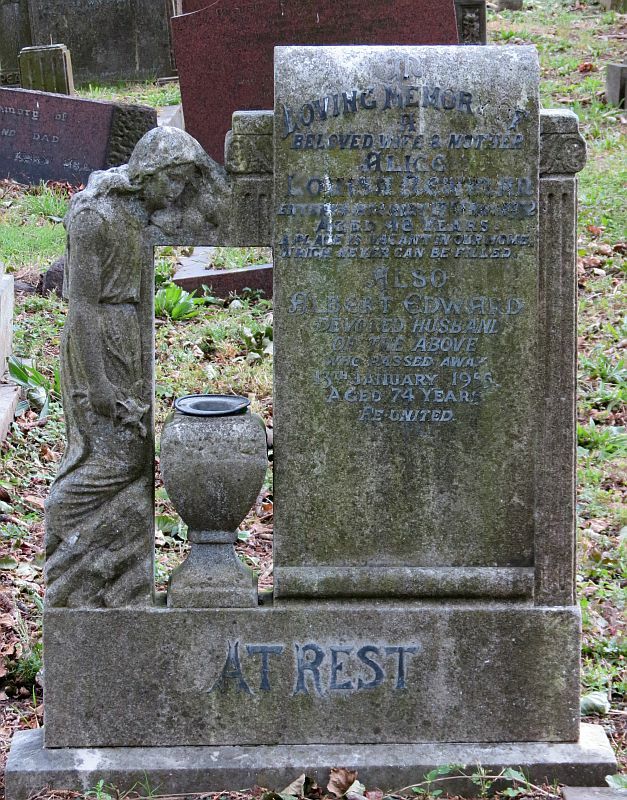 At the simpler end, a headstone may have a pot carved upon it in high relief; an odd idea when you come to think of it. 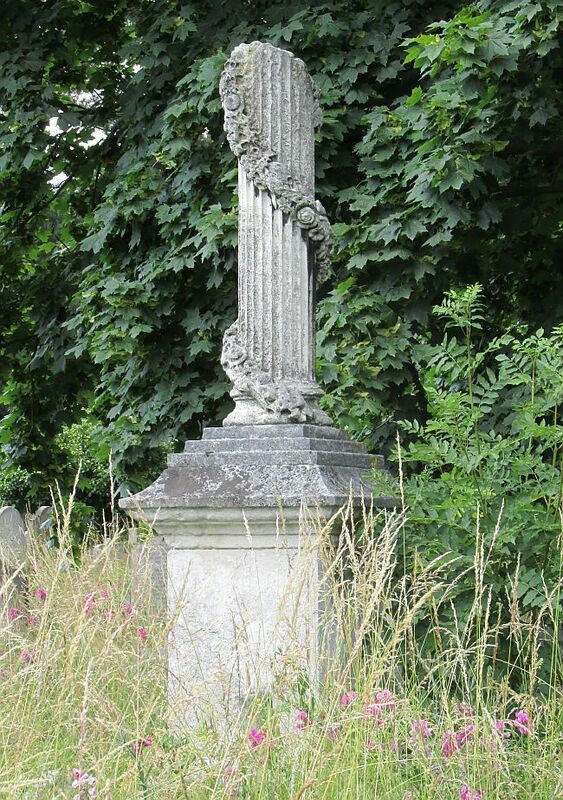 Pillar, pillar, pillar, girl with pillar . 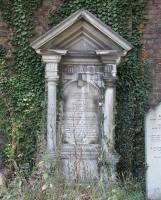 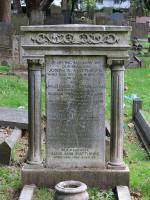 Continuing, pillars are next in our hierarchy of tombstones. The normal type is Classical, of course, and may be smooth-shafted, or with fluting, as in the examples above left. 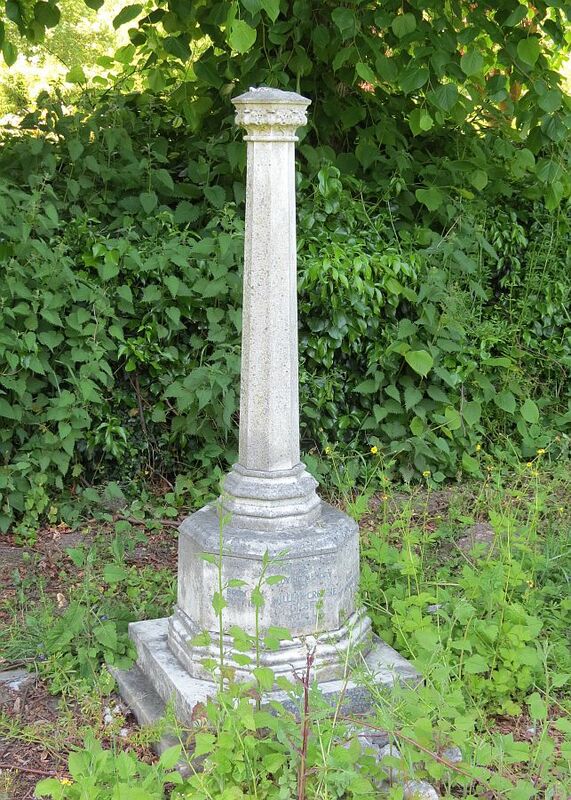 There is generally a heavy, blocky base, and thus a smaller base to the pillar, but capitals are less common because usually the pillar is broken. 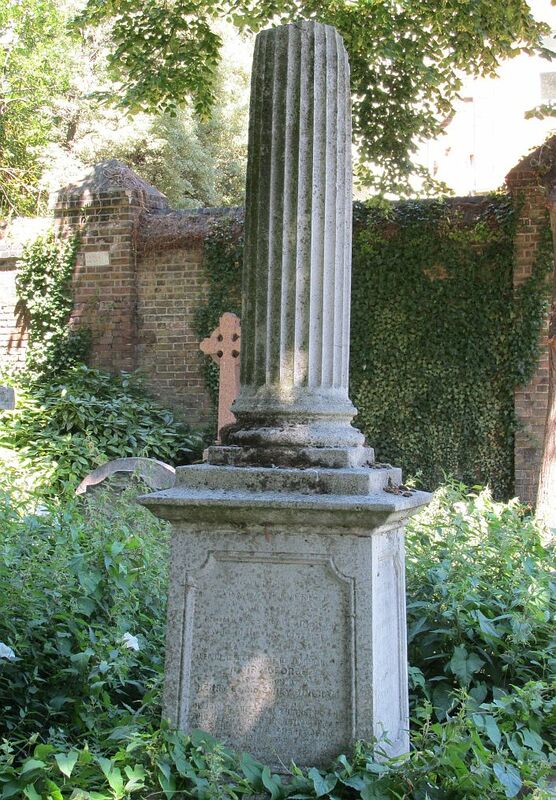 Inside a church, a monument with a broken pillar generally indicates the extinction of the male line of a family, but out in the cemeteries and churchyards this does not seem to be particularly the case - after all, these are generally 19th Century memorials and the close attention to symbolism had been lost by then, at least in tombs. 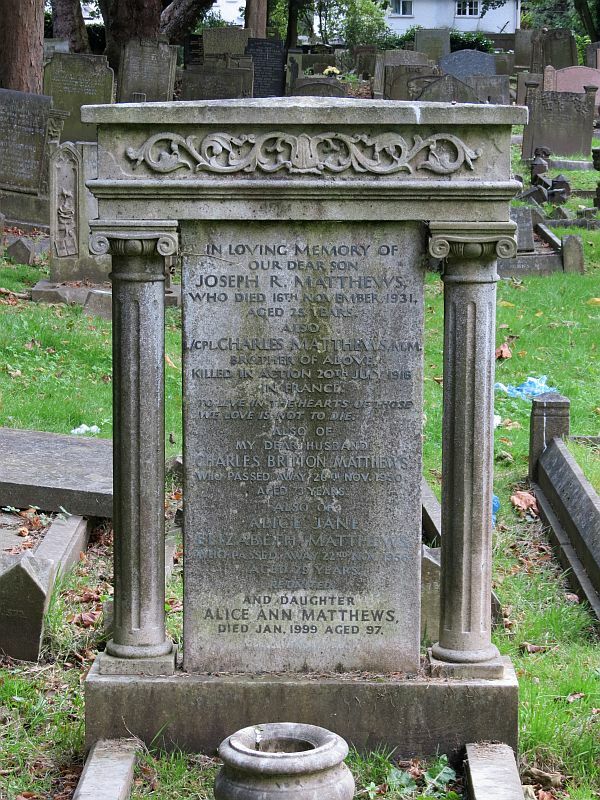 The second example above is carved with a festoon of flowers winding around the column, and this is typical of sculptural decoration on the Classical pillar; wreaths are also found, and the occasional roundel with an inscription or portrait, though generally such things are left to the base. 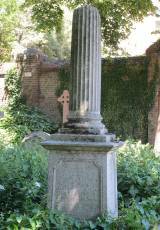 Gothic pillars on their own are much less common, and the one above second from the right is a typical example, this time with a capital, and the proportions of the column or shaft much thinner for the size of base than in the Classical idiom. 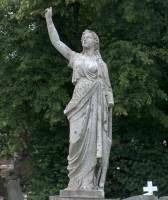 The final example above right shows a broken pillar being used for the monumental inscription, next to a rather fine statue of the deceased as a standing girl with Byzantine style folds to her gown, with a very un-Byzantine circlet of drapes elegantly placed around her unseen feet. 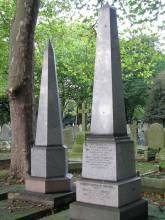 Obelisk monuments, 19th Century . 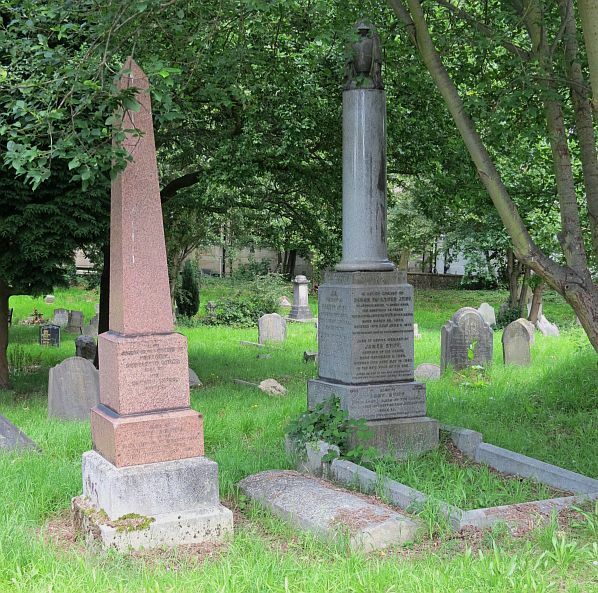 Obelisks next, quintessential symbol of Egypt, with its cult of death-worship. 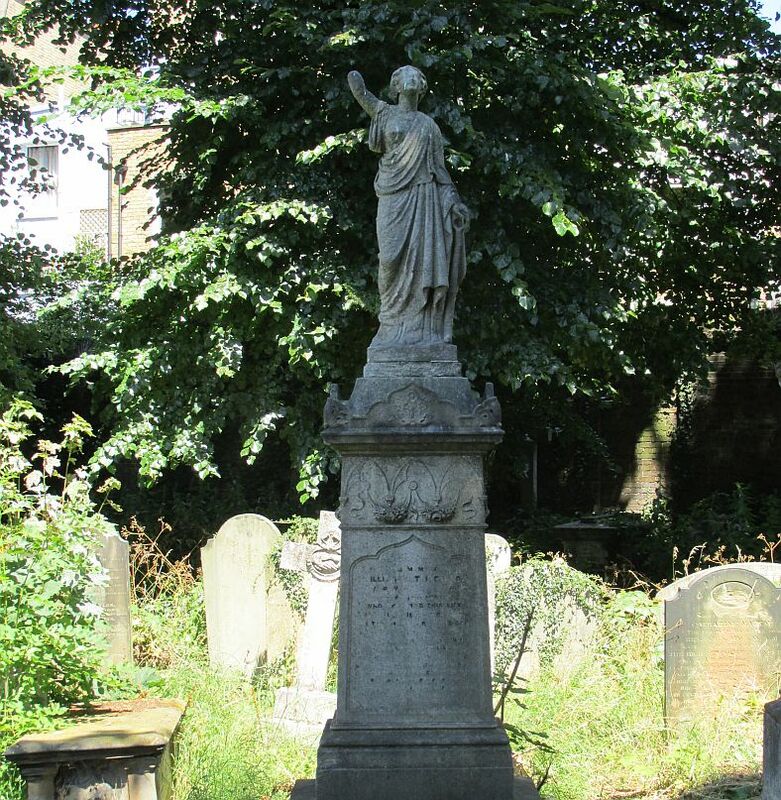 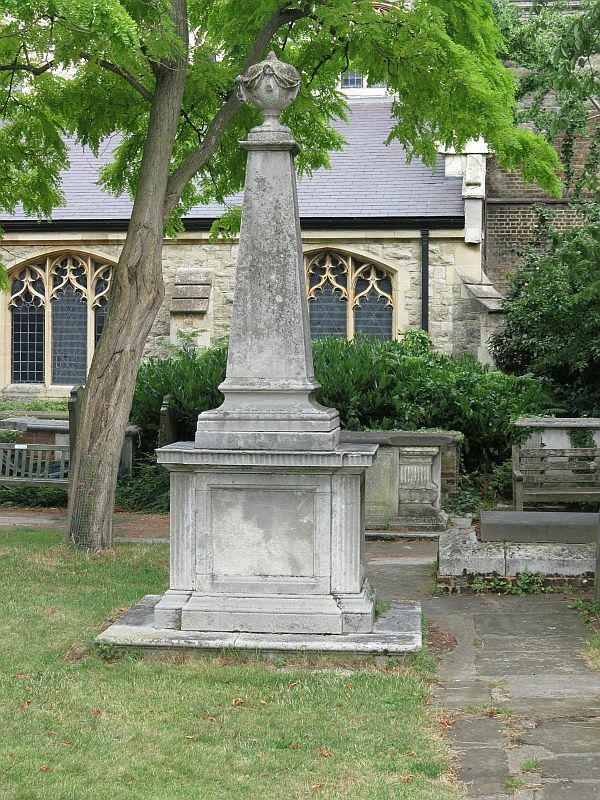 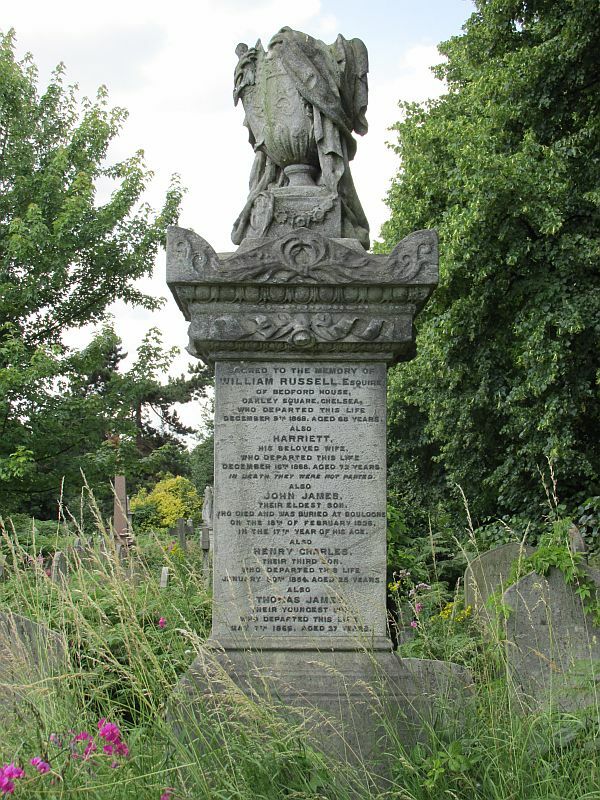 Inside the church, the flat obelisk monument had its greatest popularity in the latter part of the 18th Century, but out in the churchyard it was the 19th Century when the tall, three-dimensional obelisk really took off, above all in the late Victorian and Edwardian cemeteries. 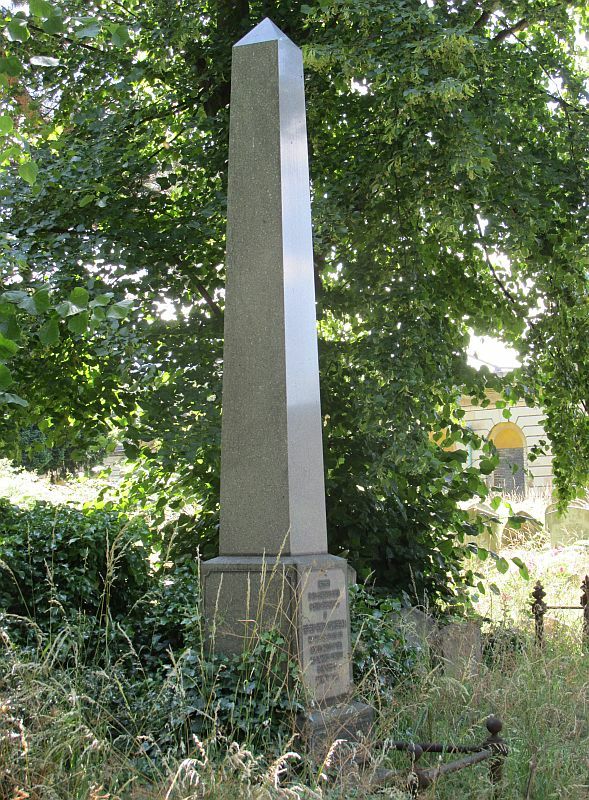 The typical example is a tall shaft of pink shap granite, tapering slowly as we ascend, and with a sharp angle just below the top to form a pyramidal summit. 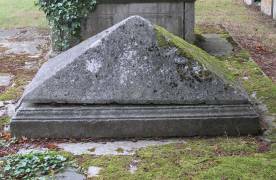 There would usually be a square base, and perhaps one or more steps. 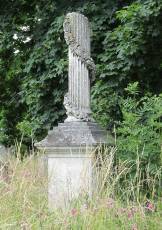 There is a Classical equivalent, almost invariably in the favoured white stone – Portland stone or some similar white limestone – with a plinth for a base, often with corner pillars or pilasters, and a proper shelf between base and obelisk, and often a sharper angle and thus a shorter height. 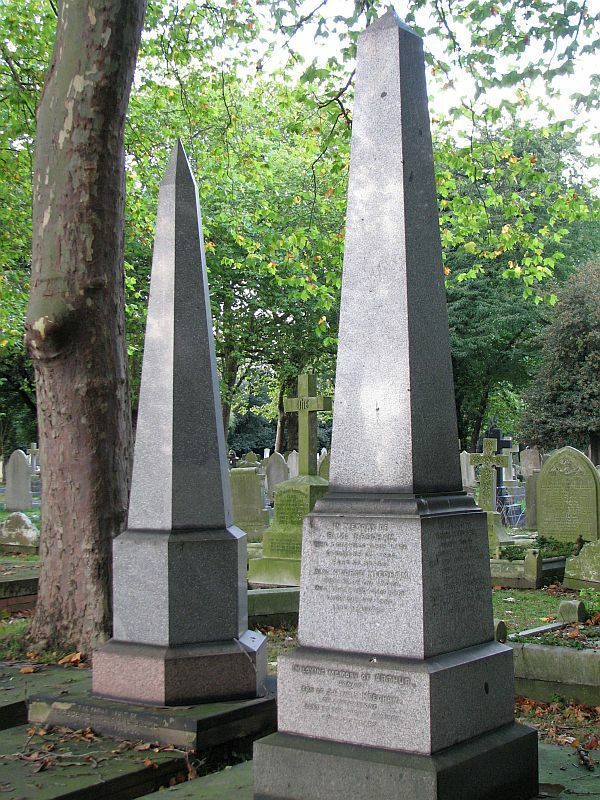 A natural extension of the Classical type would be to pile up two or three square plinths of decreasing size to form a truly Classical obelisk. And by mid-Victorian times the revival of Gothic demanded a new type of obelisk equivalent – the Gothic spire monument, like a miniature, or not so miniature, church spire, sharply pointed and often flaring out at the base. 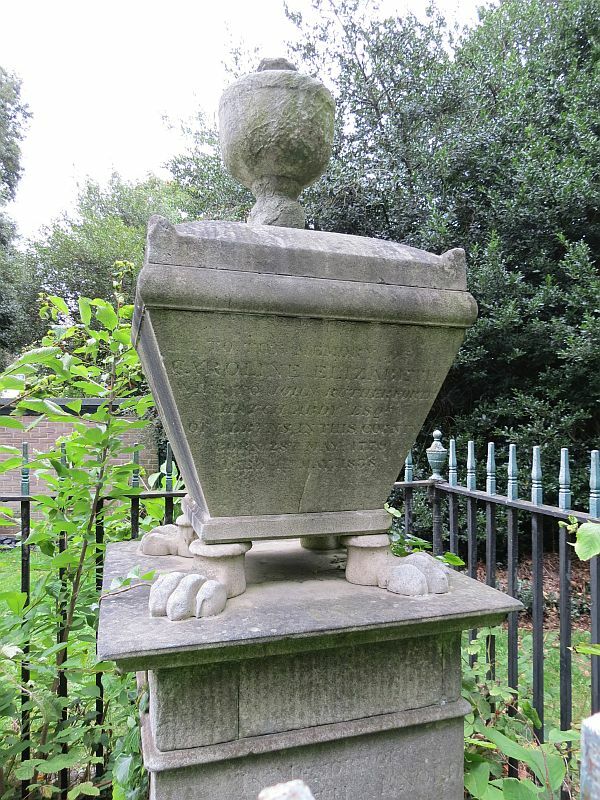 There are opportunities for sculpture on obelisk monuments, around the base, or a wreath around the middle, a portrait roundel on one side, or lion feet or scrolly corner pieces. 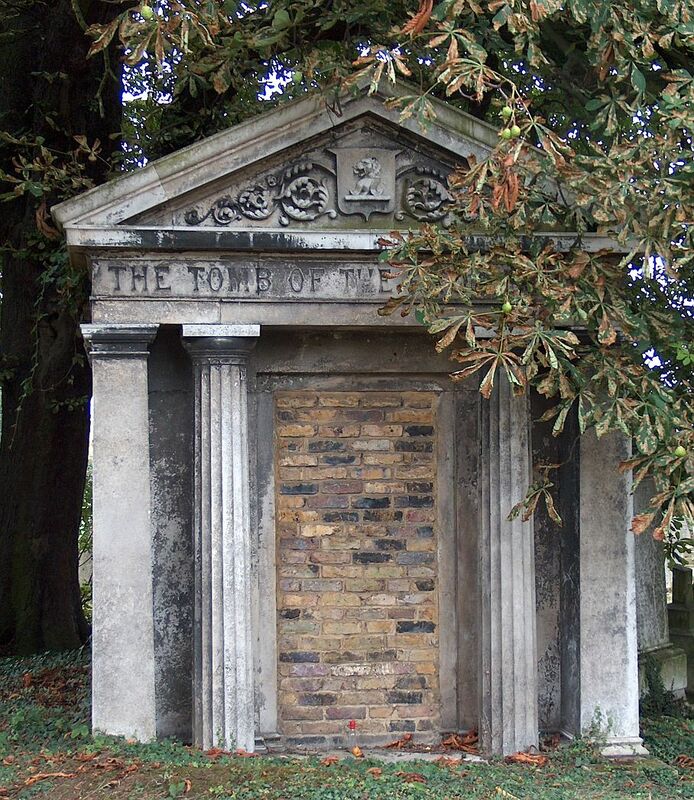 But it is fair to say that this is not the norm, and most obelisk tombs are long, smooth things with no ornament at all. 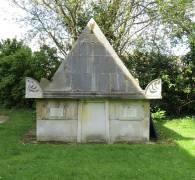 Pyramid tombs, increasing height . Egypt inspires another Churchyard monument type, the pyramid, never common in the English churchyard, and with most examples I have seen dating from the 18th Century. Any angle can be chosen, and mostly rather than emphasising the exotic, the pyramid is used as part of a Classical monument, in white limestone. 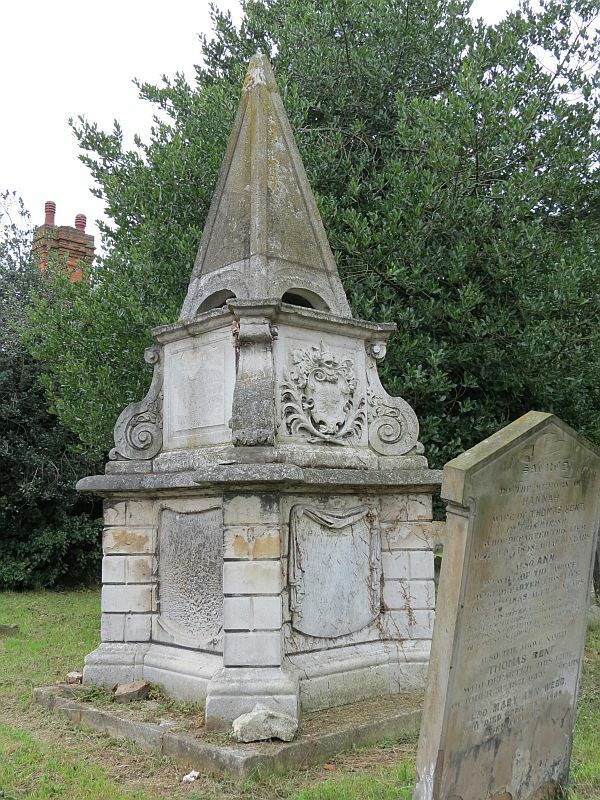 There may be ornament on the base, but on the pyramid proper, there is generally not even the inscription. 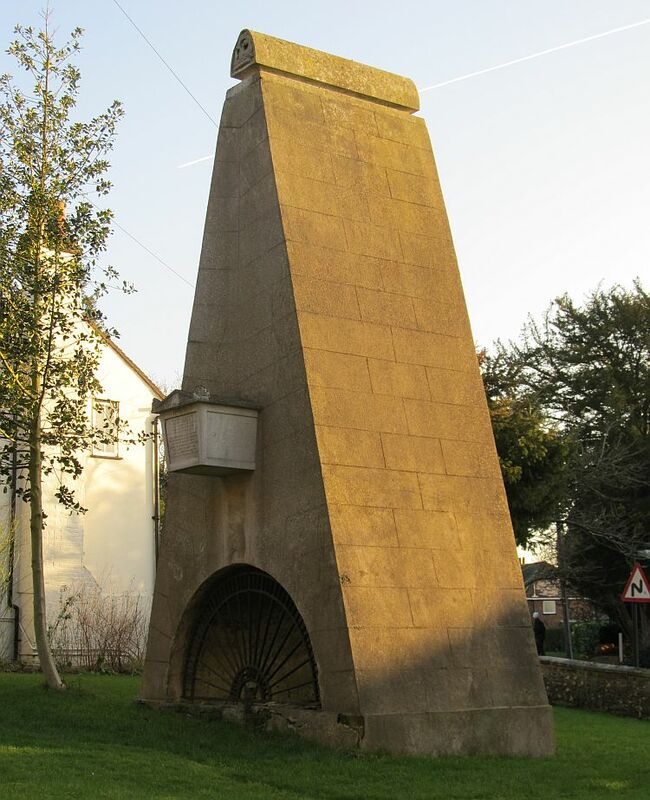 Most bizarre of all examples, in thoroughly civilised Pinner in north west London of all places, is the tall pyramid in masonry with a stone coffin thrust straight through it. 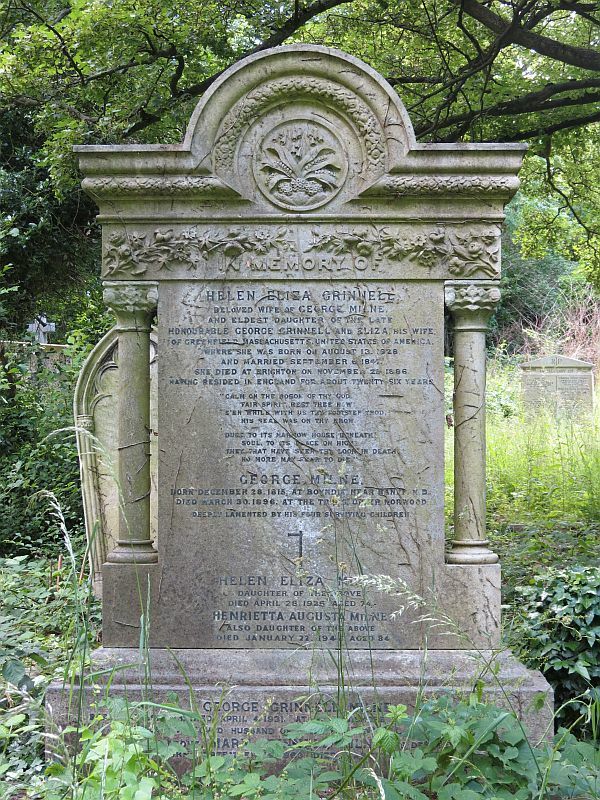 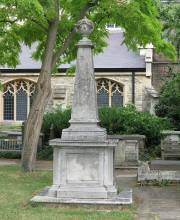 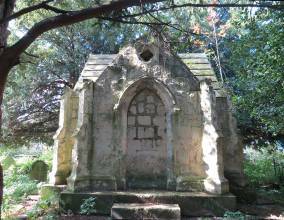 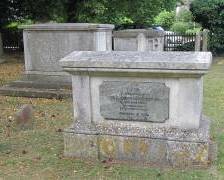 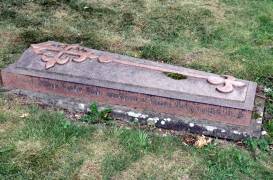 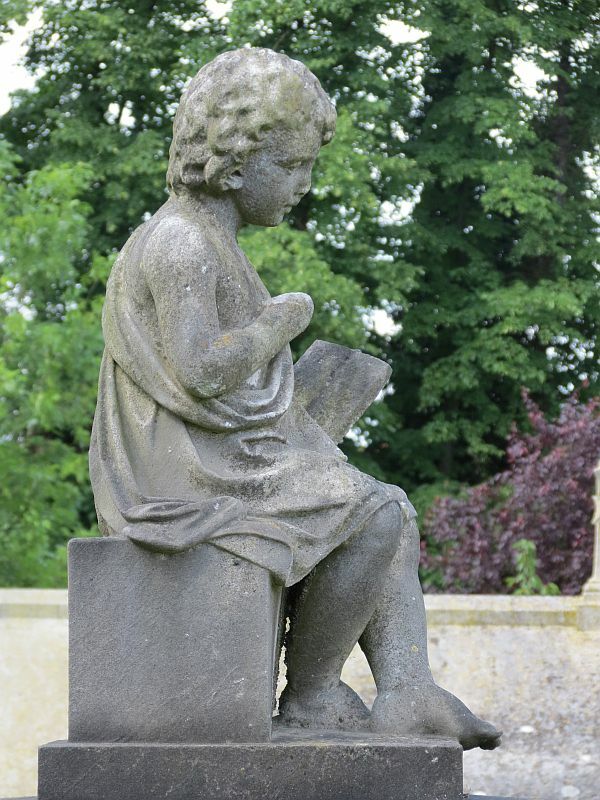 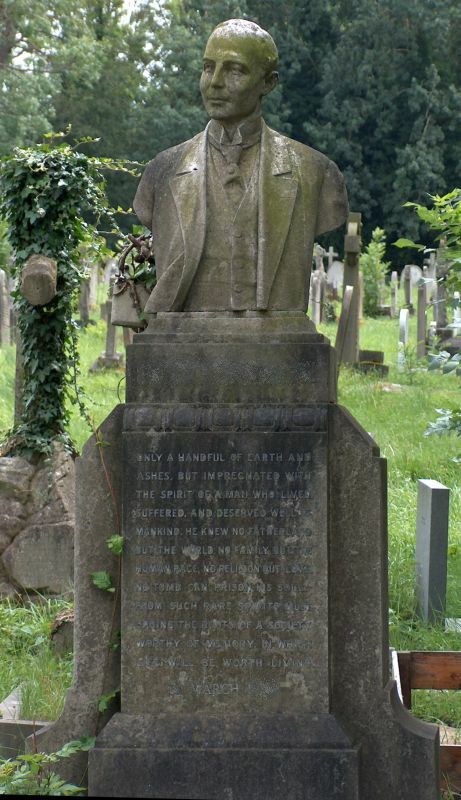 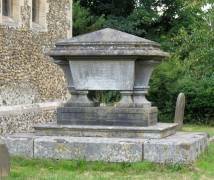 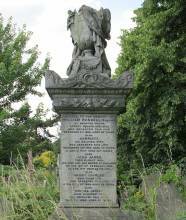 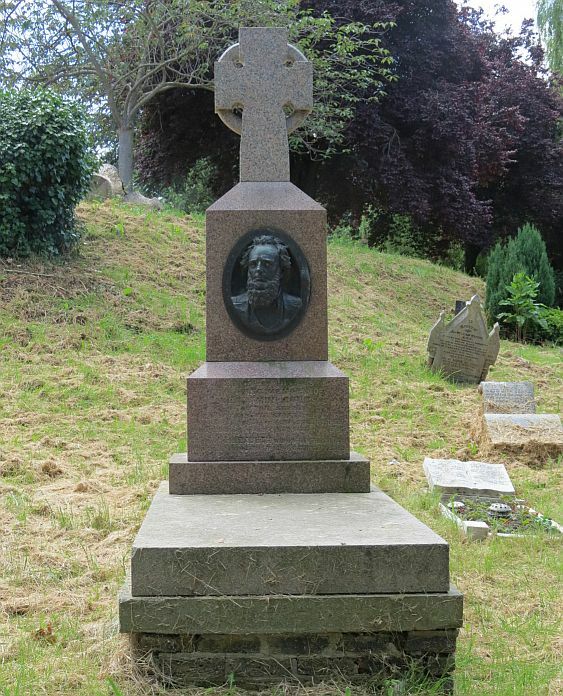 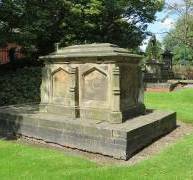 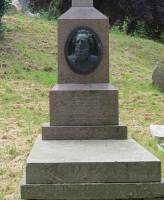 The story, though generally dismissed, is that of a couple who inherited the use of a fortune so long as they remained above ground, the idea being that the son came up with this novel memorial so as not to forfeit their inheritance when they died. 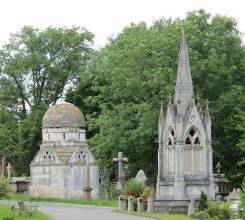 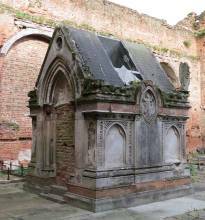 Mausoleum monuments: Classical, Egyptian and Gothic . 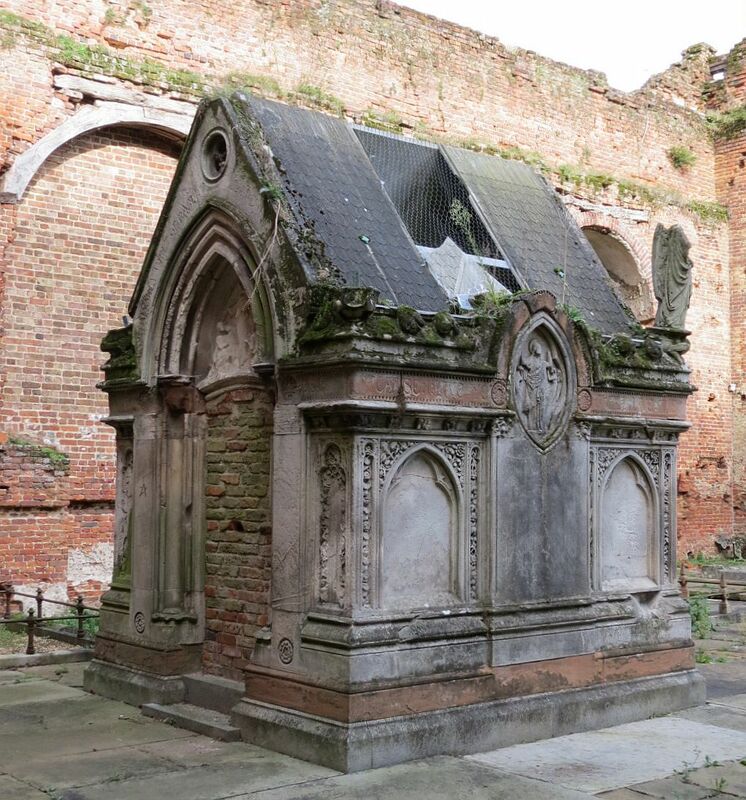 Largest of all architectural monuments is the mausoleum, Classical ones from the 18th Century and a variety in the 19th Century, found mostly in the great cemeteries. They can reach remarkable proportions; at their grandest they are like scale models of cathedrals with broad domes, complex porticoes and windows, or miniature Greek temples. 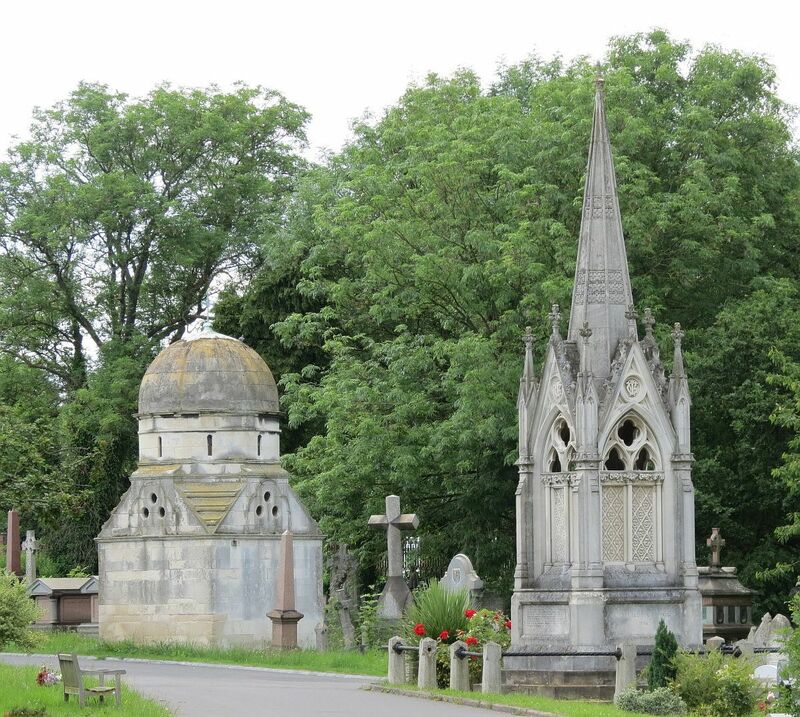 As well as Classical mausoleums (or mausolea), there can be found Gothic examples and Egyptian ones, such as that shown in the picture second from left above. 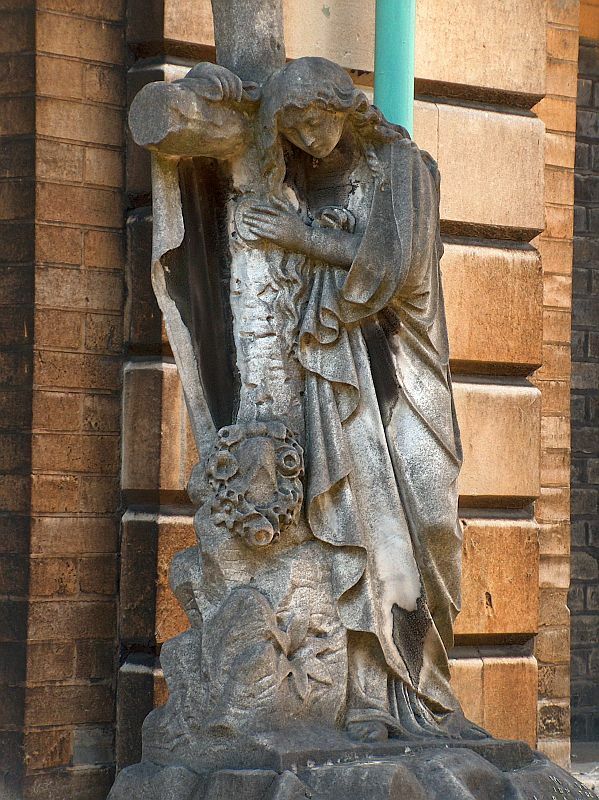 All of them offer opportunity for sculptural decoration, especially around the doors and on the summit, also on blind panelling on the sides, or with free-standing statues on and around the central building. 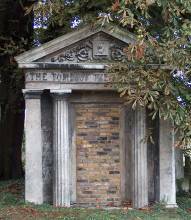 There must be many hundreds of these strange buildings dotted around the country, above all in and around London, but with some remarkable examples elsewhere. Even so, they are comparatively rare, and it is sad to see in some old Churchyard a single example of such a splendid monument being left to decay away, destroyed by time and ivy and vandals. 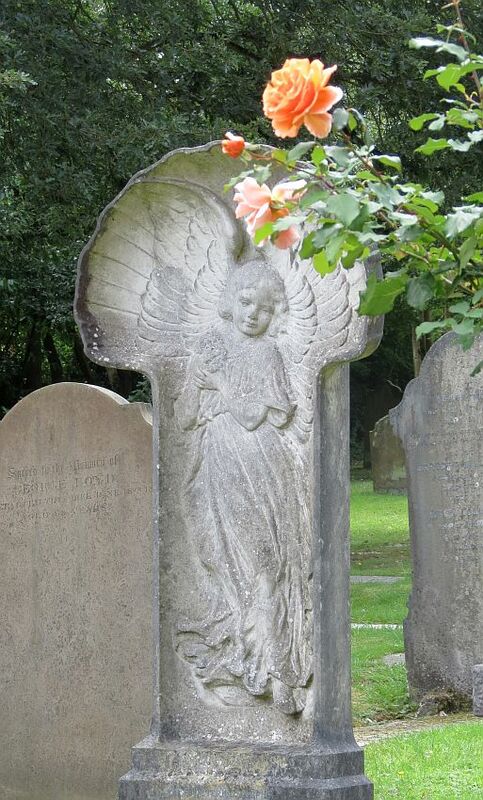 Angel statues from churchyard and cemetery . 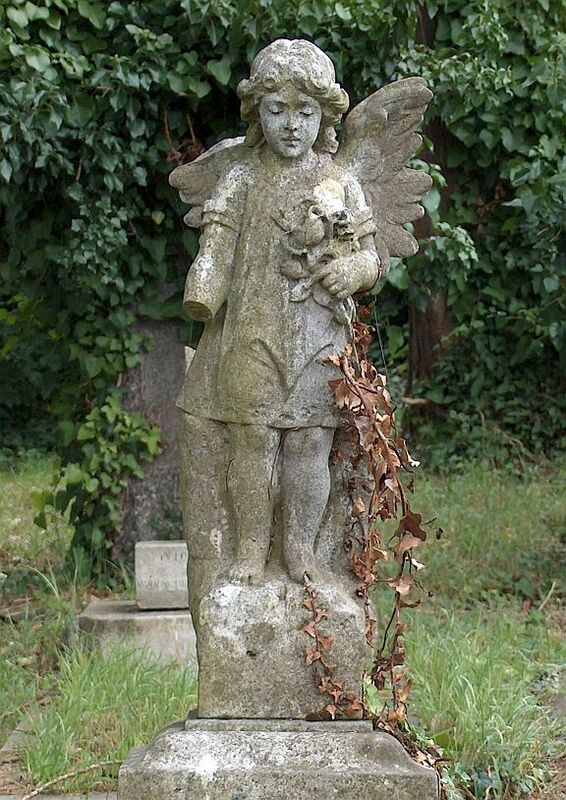 There are many cherubs too, again most familiar in the too-prettified little creatures beloved of the late Victorians and in miniature scale from throughout the 20th Century too. 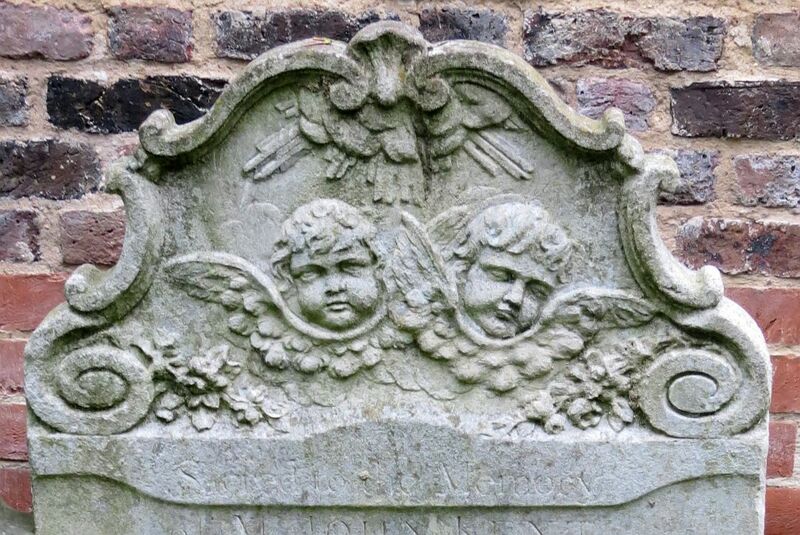 But the earlier ones from the late 18th Century have more vigour and art to them, and there are good examples at least of winged cherubic heads used in a decorative sense from throughout the period. 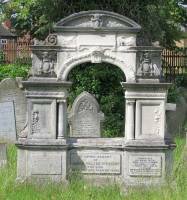 The central example above is one of the earlier ones, the others from Victorian and Edwardian times. 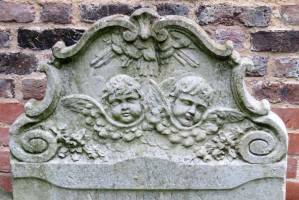 For more generally on cherub sculpture, see this page. 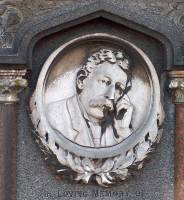 The portrait, either in relief or a full portrait bust, is commonly found, often the work of a skilled sculptor, mostly anonymous today, leaving only their skilled work as a memory. 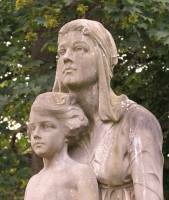 Portrait sculpture on monuments . 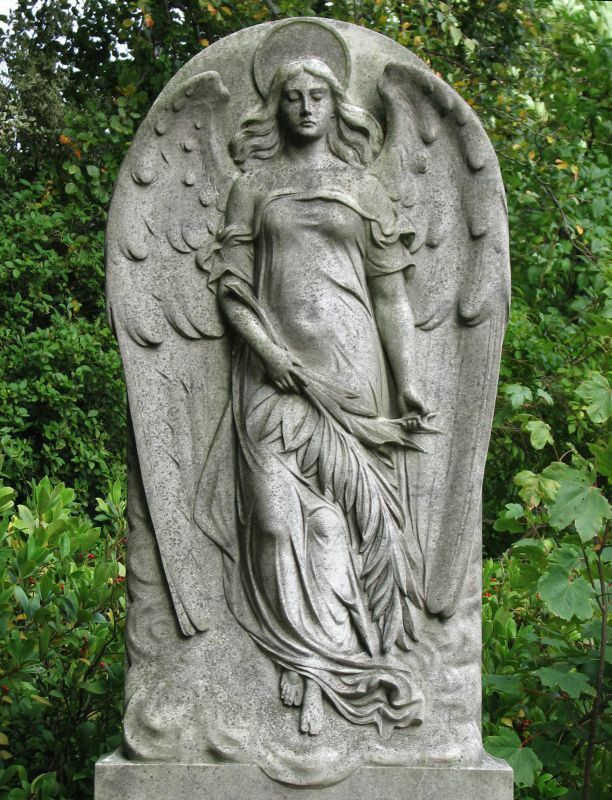 Full figure sculpture is surprisingly common – some cemeteries have whole pantheons of statues, more than any art gallery. 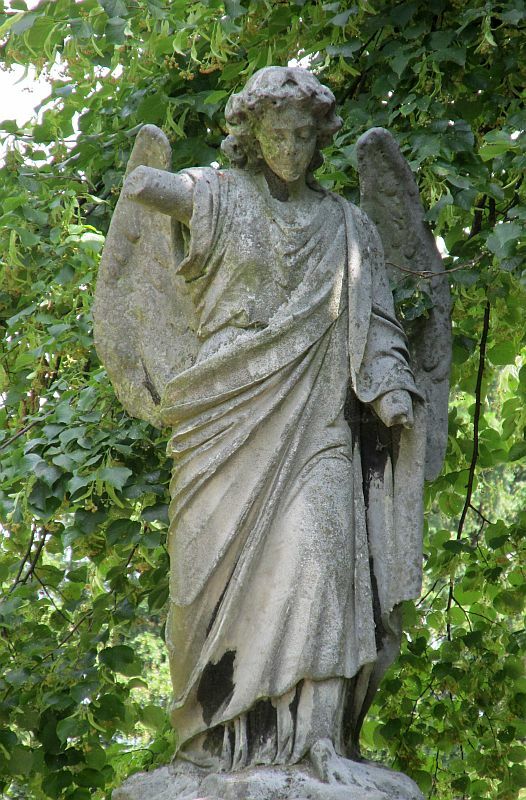 Classical drapery is de rigour. Inside the churches, the mourning girl with pot in white marble is a common ornament, representing, we can generally suppose, the wife mourning for the husband, or less often some allegory. 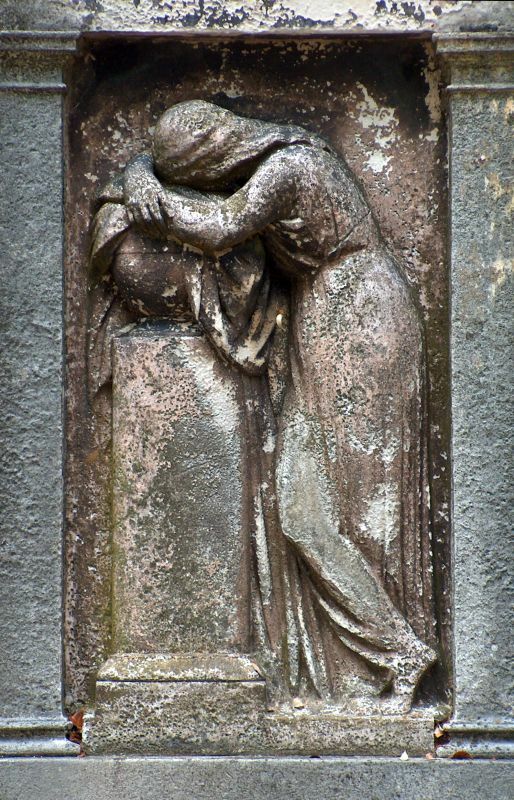 In the churchyard and cemetery, the nearest equivalent is found also in relief, on smaller monuments, the main difference being that the drapery is simpler and fine detail is avoided, for obvious reasons. 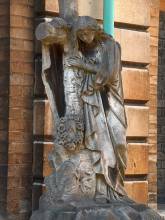 Often the slight weathering produces a variation of texture and light and shade far beyond what is seen in the church, adding to the dramatic scene. 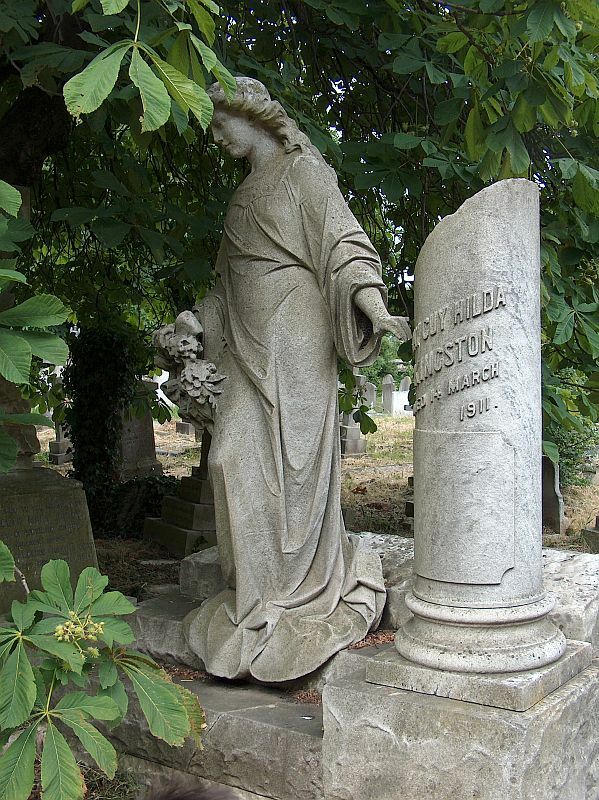 The full statue of a girl with a pot is more common outside the church than inside, and these are some of the most excellent of monuments. 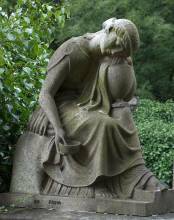 Indeed, the sculptors often seem inspired to produce their best and most complex drapery on the youthful and mournful female figure. And female figure it generally is, for other than the occasional portrait statue and the odd hermit, the male statue in the cemetery is vanishingly rare. 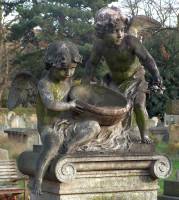 Marble girls with pots . 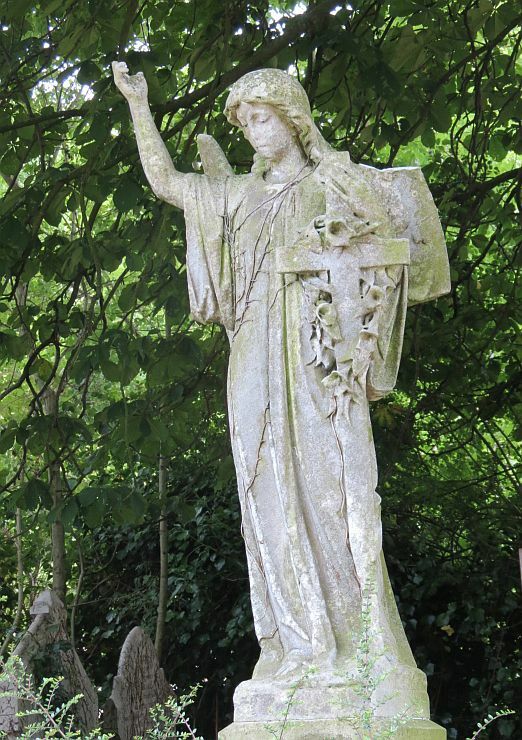 The full statue of a girl with a large crucifix often replaces the girl with pot, and with wings she becomes an angel with a cross or crucifix (strictly speaking the crucifix shows a crucifixion), and such monuments are far more common than their equivalents within the churches. 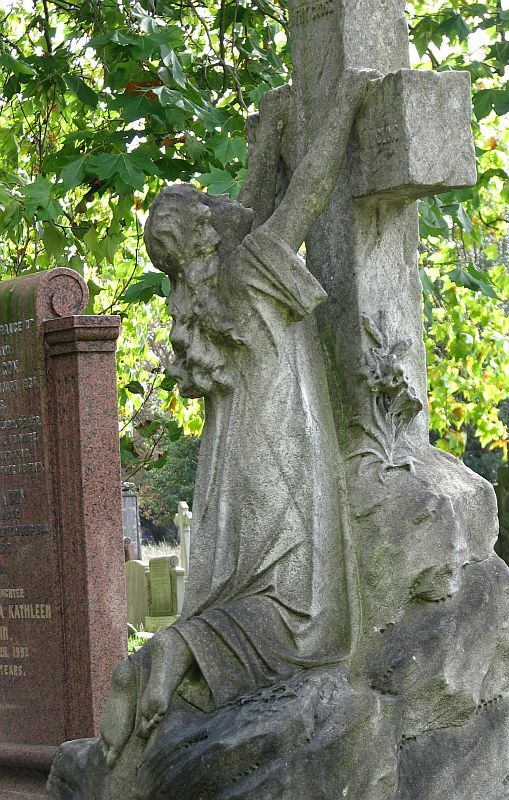 In part this is timing – the majority of the indoor monuments are no later than the 1840s, while the outdoor figures are a generation or so later, when the sense that the representation of the cross was a bit too Catholic for the early Victorian Protestant had been replaced by a more eclectic or we might say catholic taste. 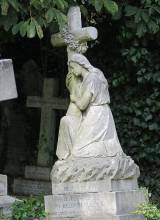 Regardless, from an artistic point of view, we must welcome the cross as allowing a wide range of charming poses, with the mourning female clasping, embracing, or collapsing grief-stricken against the cross, though often it is used compositionally as no more than the structural support for the outspread wings of an angel. 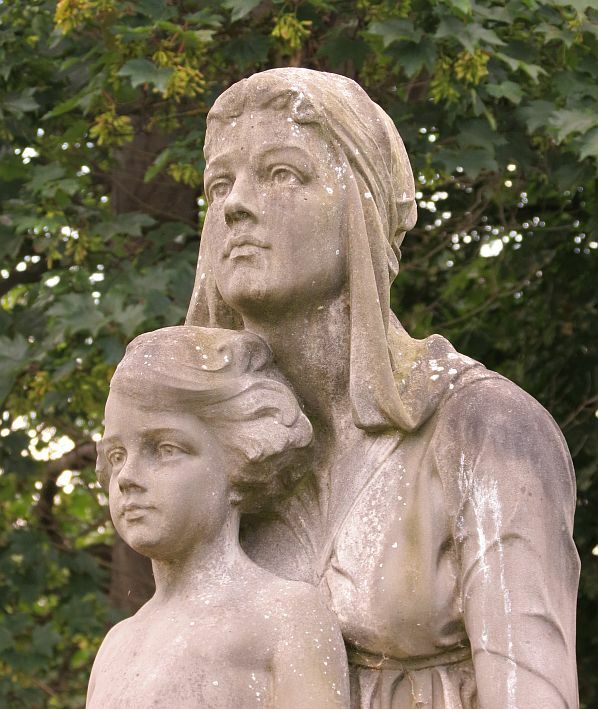 Our examples below are all girls rather than angels, and show how much pathos can be put into a monumental sculpture without tipping over into sentimentality. 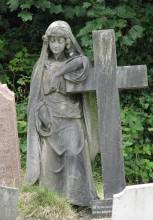 Girls with crosses, late 19th and early 20th Centuries . 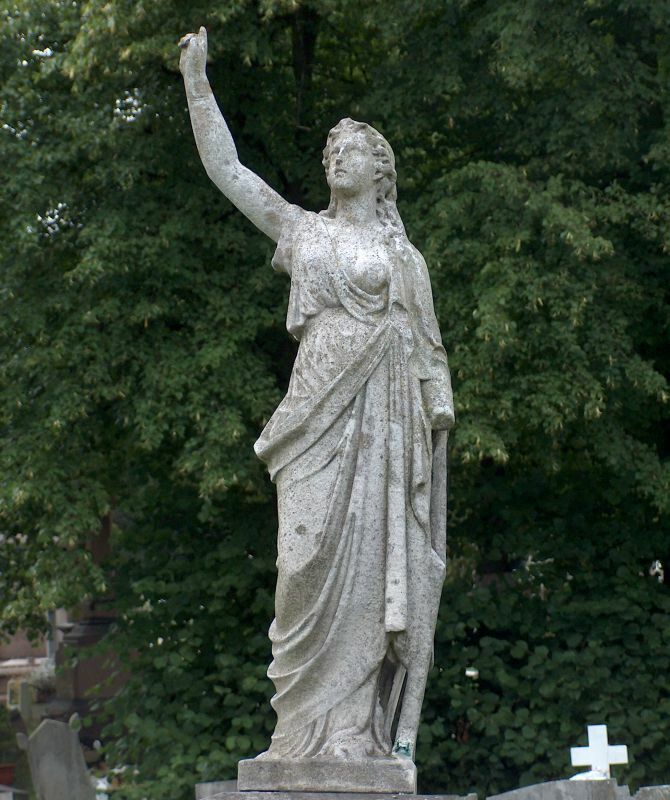 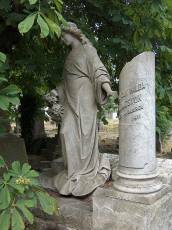 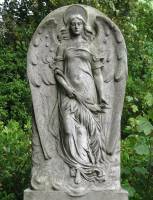 One other pose for the cemetery statue must be mentioned, which is the female figure looking upwards and stretching one hand towards the sky. Far more dramatic out of doors than inside, silhouetted against bright sky or dark foliage, these statues are perhaps those with the most sense of place in the cemetery.